Fabulous sunshine emerged from the earlier mist to grace our invite day with perfect weather. It was certainly very welcome! 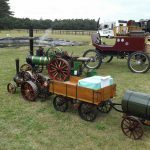 As today was one of our dedicated days when we can get together and play engines, it was hoped to have a goodly contingent of engines and toys of various types, as well as a varied collection of drivers. 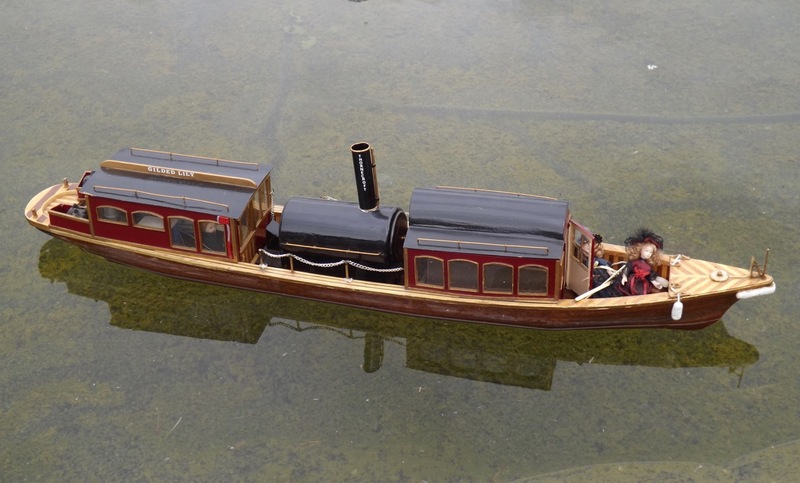 Today’s turnout did not disappoint, as we saw railway locos of many methods of propulsion, road steam, as well as a small flotilla of boats on the pond. 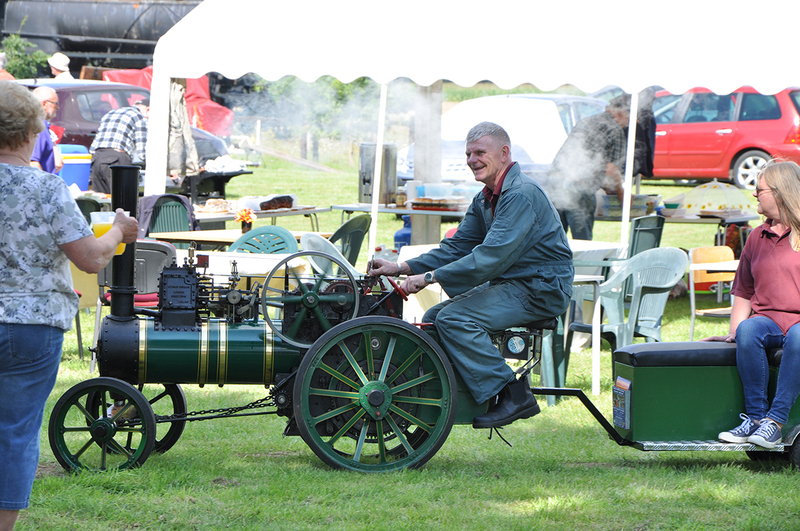 We also saw many people trying their hands at engine driving for the first time and thoroughly enjoying themselves. 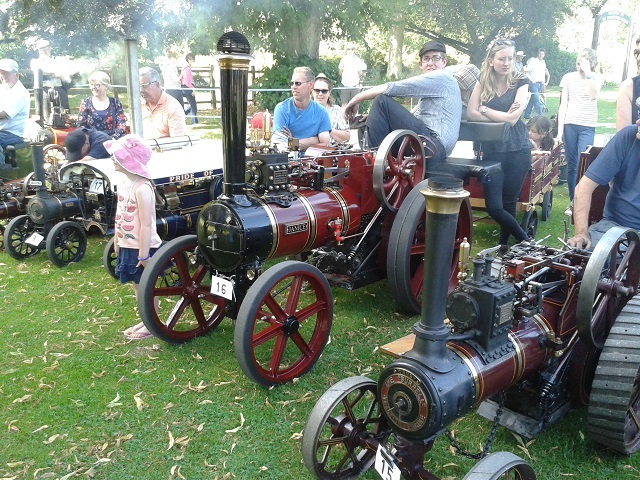 We were even lucky enough to have a few visitors from neighbouring clubs join us with their engines. 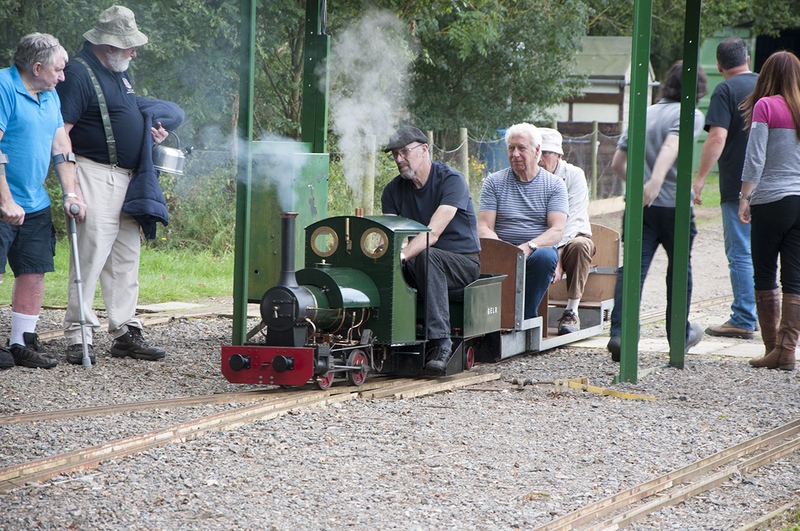 The resident standard gauge loco “Little Barford” was also in steam, chugging up and down its track with its wagon. 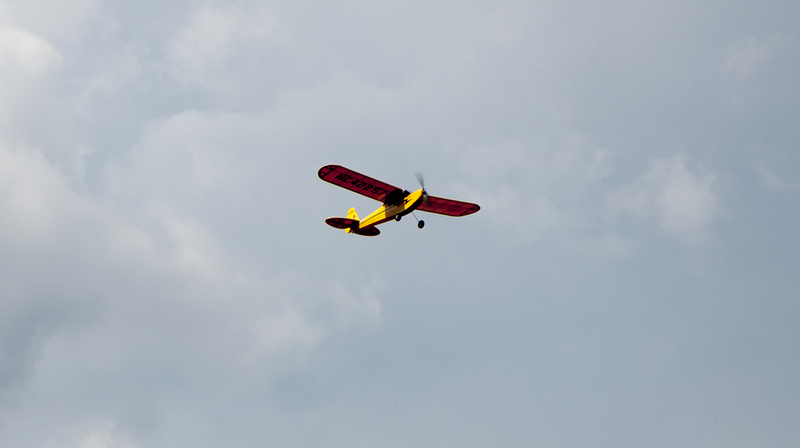 The skies above us also buzzed to the presence of model aircraft. In summary, a good selection of toys, that is best shown in photos than described in words. The catering department really went to town and provided us with a splendid spread. Roast pork rolls, baked potatoes, coleslaw and all the trimmings made for a very impressive and civilised al fresco lunch. 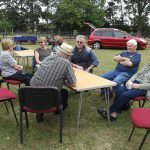 Cake soon followed, and I’m sure I speak for all when I say that the food was excellent, and we heartily thank all those that helped to provide this glorious repast. Outstanding! 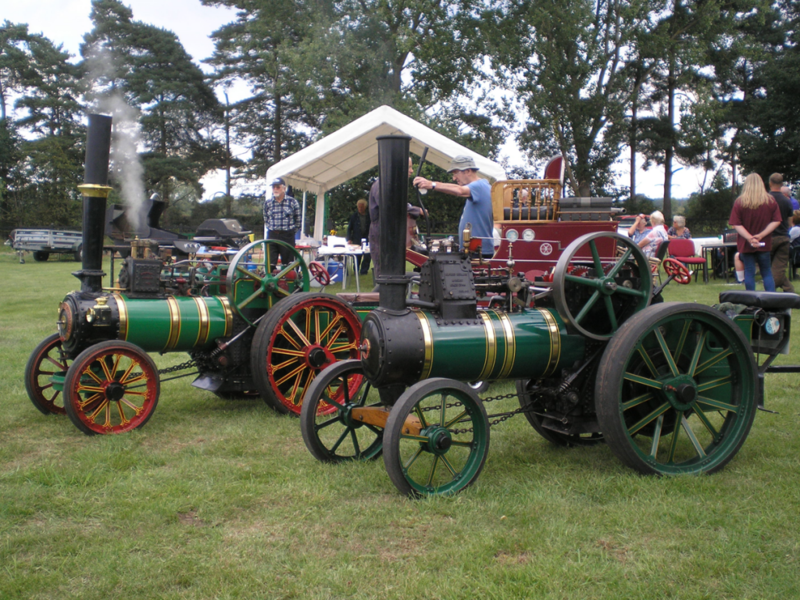 Among the engines present were a few rarities. 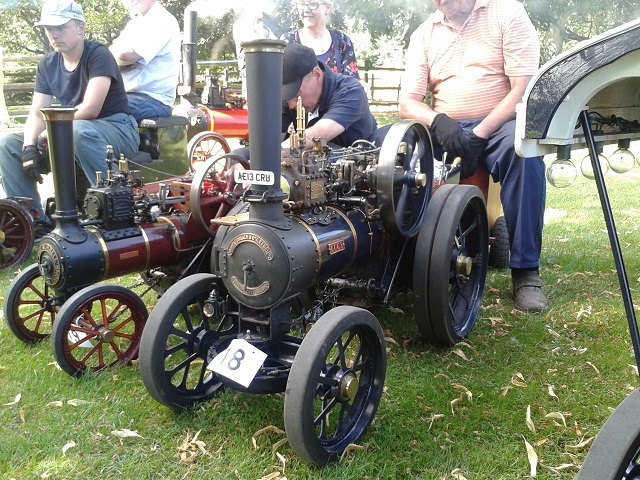 Not only did we have a good selection of club members’ engines, we had among the visitors a 7 ¼” gauge GER T26 and a 4” scale Dodman single crank compound traction engine. 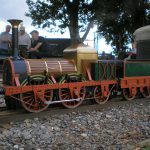 The T26 was a very beautiful engine to behold, ably demonstrating the style of locomotives made at the very end of the Victorian period. 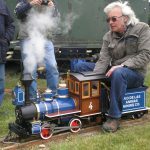 I was lucky enough to have a drive of this delightful engine and I can report that it runs like a Swiss watch, with, as LBSC would say, “good even puffs”. 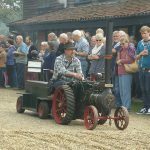 Dodmans only constructed one traction engine using their design of single crank compound engine. 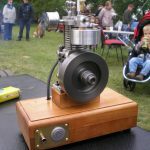 This engine does not survive, so we must seek out the rarely seen model versions to get an idea of what they were like. 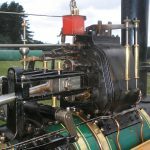 It wasn’t just Burrell’s of Thetford that came up with a design to link the two pistons of a compound cylinder block to a single connecting rod and thus only a single crank on the crankshaft. 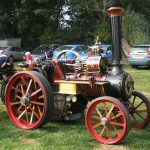 However it was Burrell’s that filed for the patent, and they sufficiently “leant” on Dodmans so that Dodmans never built more than their original engine. 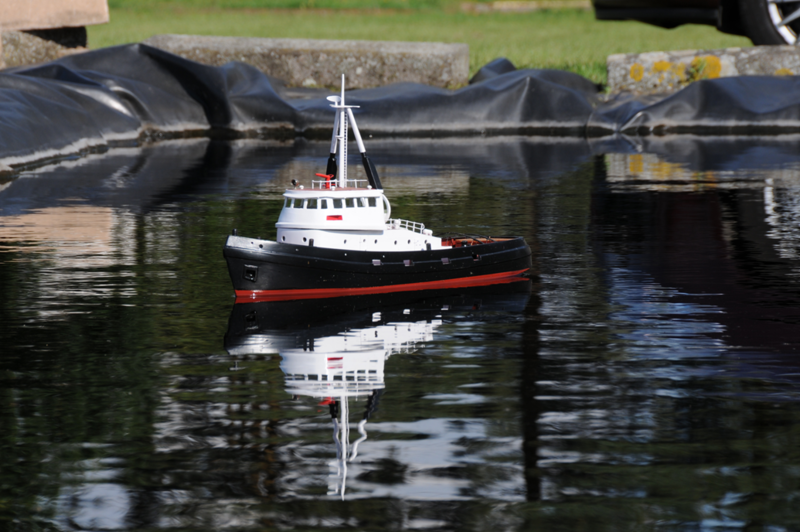 Consequently it was great to have this model to look at and enjoy. 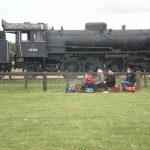 I think it’s fair to say that we all had a fun day, enjoying watching the engines going by, a great lunch, the glorious weather, and a jolly good chinwag! Many thanks to all who made it possible. 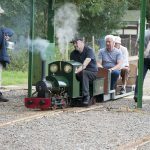 Thanks to Kev B for this write up – below is some of his pictures. The Fun day started early Mike S and MickW with Stuart F arriving at the track about 7.45am. We had one gas barbeques, one spare gas cylinder, 10kilos of Pork Shoulder , about 60 gigantic potatoes, the same amount of sweet corn, 6 pints of milk and a few other things like butter, sauces and the like , We set up Mike S barbeque first to get the 10kilos of Shoulder started, by 8.am we were up to temperature and the meat was cooking. 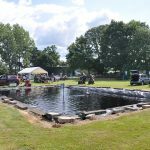 Next the Marque was loaded on the trailer and the marque was up, Dave M had arrived Ralph R Geoff E and Geoff B had also arrived. Still much to be done, StuartF and I left to pick up my barbeque from home to cook the potatoes, all these had to be oiled and wrapped in silver foil, at this time we realised that we had no room for the corn on the cob, so Ralph R went home to get his Barbeque, John C was brewing up it was about 10am, it felt like 2pm. 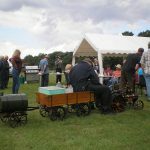 Many more people were arriving and first electric loco’s started rolling, soon the steam loco’s were also running, we had several Traction Engines running and the weather had turned from early mist and fog to a really superb late summers day. More food arrived and the tables were set up. in and around the marque, Raffle prizes were shown on a separate table , we even had a few flowers dotted around on the tables. 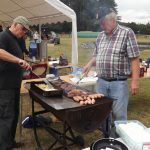 coleslaw, Thank you Stuart F for the slicing of the meat, Thank you to the two young ladies who did the raffle tickets, a superb effort. And thank you also to every one who made this event a very special occasion. 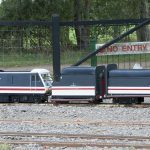 Visitors from Cambridge MES bought a Class 90, Two people from Halesworth MES had arrived and were all greeted by Mike H who was there on hand to guild them through what had been done at the track since they were last here. 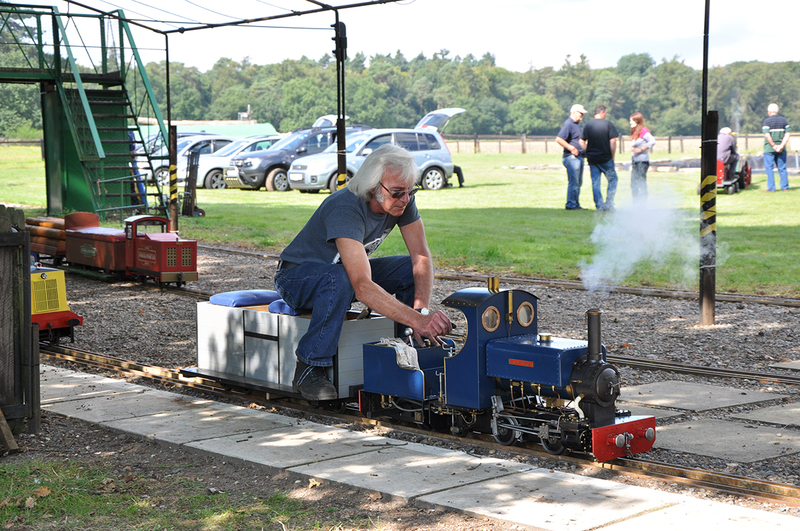 We had a superb engine from Ipswich MES a GER T26 and this chap was very willing to allow everyone who wanted to drive it drive it, a very large 7 1/4 locomotive in very nice GER blue with red lining. 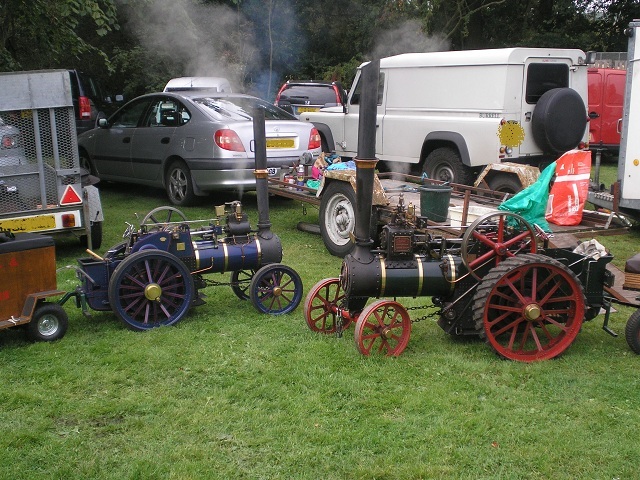 At stages there were many engines going round, even some young drivers. Ray R steam car was running , Little Barford was giving rides and it had to be said every one had a very pleasant day. As a vegan, I think people who sell meat are disgusting. But apparently people who sell vegetable’s are grocer. Four pictures above show what a diverse club we are , all from our fun day. 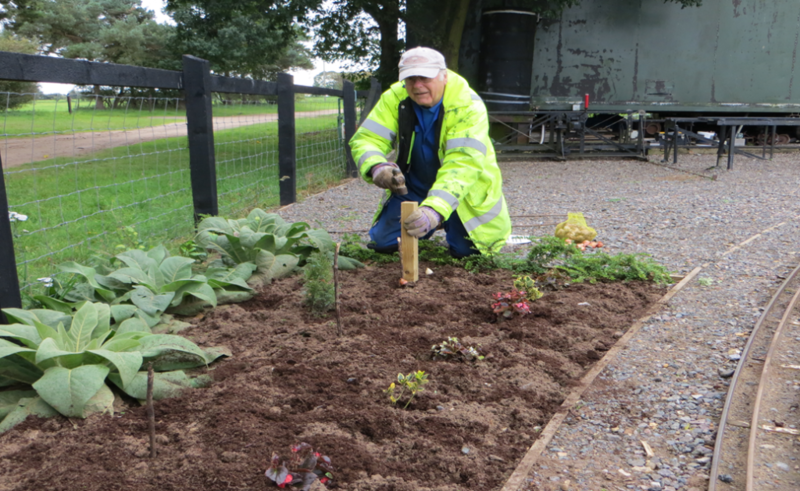 We are continuing to stock the garden plot on the right hand side of the track near the gantry Here is Geoff B in his other role planting some 50 or so Daffodil and Tulip bulbs. This should give us an early splash of colour next year. View more pictures from the day in out Gallery below. 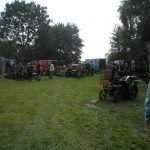 On Saturday 8th of Aug a few of us brave souls gathered at the club track for what is hoped will become the first annual road run down to the Saxon pub in Weeting. 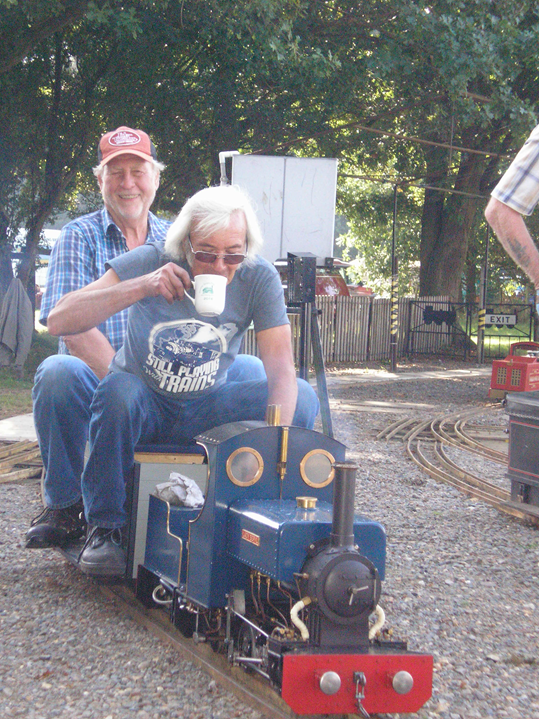 Four engines made the trip, Michael B (4” little Sampson), Peter E, Andy G (4 1/2” Burrell’s) and Chris H (3” Minnie) Sandra B was our only passenger, keeping Peter company on the trip. The allotted time of departure was decided to be 12:00; high noon! 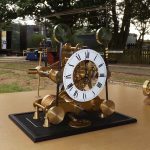 And we were on time, no mean feat when you are relying on the unknowns of raising steam! 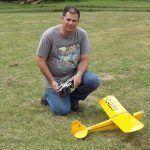 Michael decided to cross the rally field as this was a slightly shorter distance, in the end however it was to be much harder going with the deep ruts on the field and the extra drag from the grass making progress much slower and more difficult. Peter E did the trip in reverse, leaving from his house and roading to the club and back again. We had to bring our own water for the outward trip however the friendly landlord was only too happy for us to top up from his hose, for the return trip. 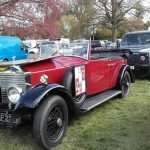 On the whole drivers treated us with gracious curiosity, waiting patiently for our ponderous convoy to pass, it took I guess about 30 minutes to make the trip to the pub which is largely downhill, something you don’t even notice in the car. 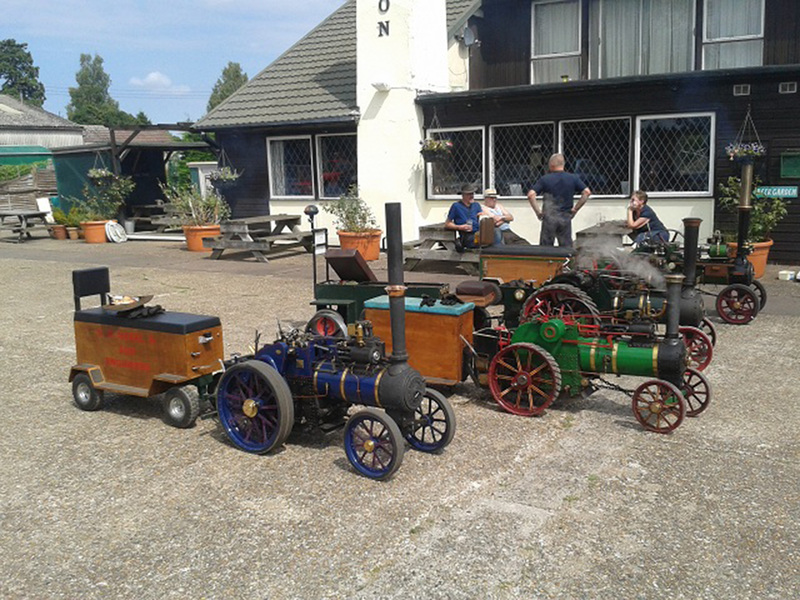 A quick pint a good chat and the usual B&DSME laughs, several people came and had a look at our strange conveyances, the landlord showed great interest and said we were more than welcome to come back, so I guess we will have to! 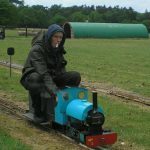 The homeward journey was uneventful, except now the hill made its gradient felt, with coal and water consumption increasing, however Andy said he didn’t add any coal at all on the return trip. Total distance covered was about 2.5 miles, Michael had a grin from ear to ear and I must admit I really enjoyed the experience, best of all no one got crushed by a 20 ton lorry and none of the engines broke down, unlike at the rally when my back axle seized solid a long way from home requiring the assistance of Andy and the “Doom-bar”* I will definitely be having a go at the proposed run from Forncett St Mary to the Tank Museum this October. 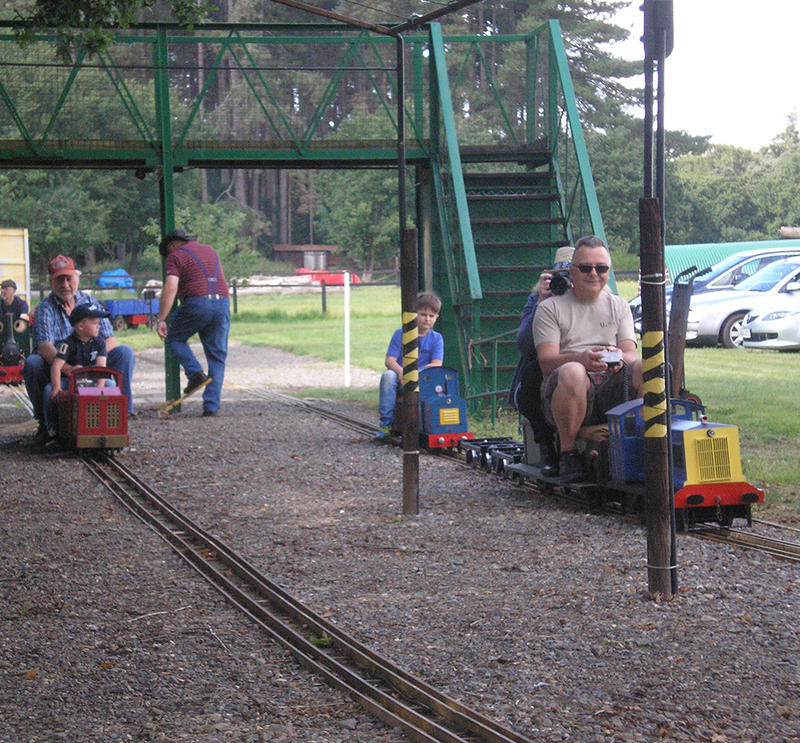 Why not come and enter or even come as a passenger, a lovely sedate way to see the Autumnal countryside. 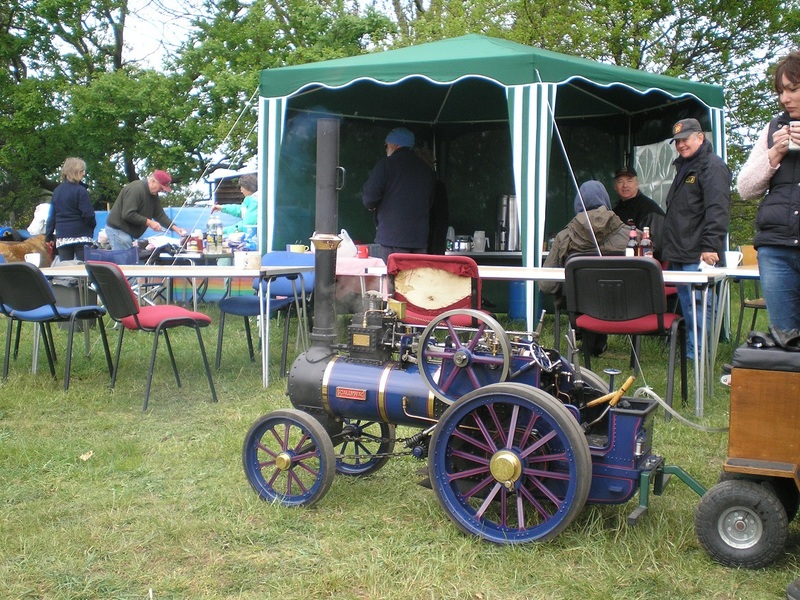 *Andy’s son named the pole, his dad keeps safely stowed on his trolley for breakdowns, this has saved several of us recently, and was christened after the Ale “Doombar” served in the beer tent this year. You know you are in trouble after the “Bar of Doom” is unbolted! 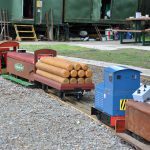 Having not been to Forncett Industrial Steam Museum for some time, we decided to have a trip there for their Model Engineers Day on 4th October. 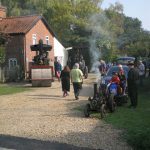 Located in some of the deepest parts of Norfolk, this museum of myriad stationary steam engines large and small is living proof of what can be achieved when you put your mind to it. 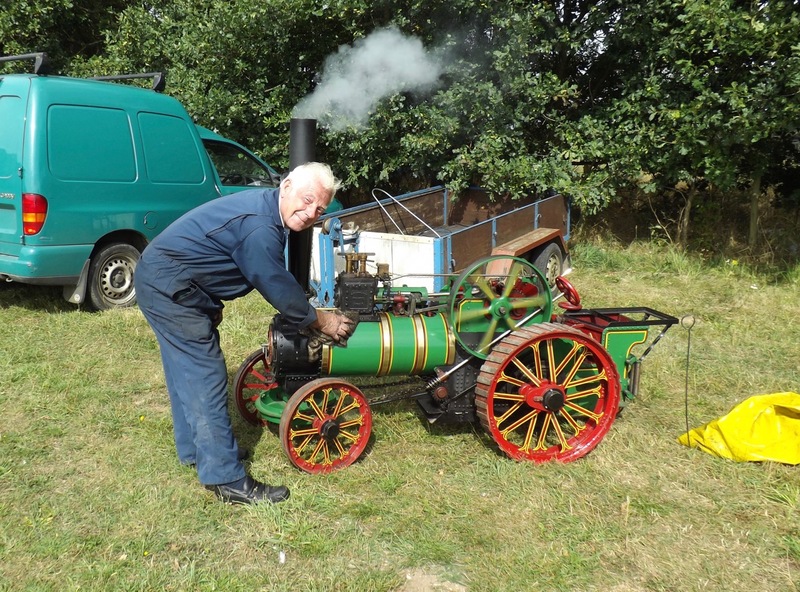 Begun by Dr Rowan Francis and thanks to his determination and at times quick actions, it now houses a large collection of stationary industrial steam engines that would otherwise have been scrapped and lost forever. 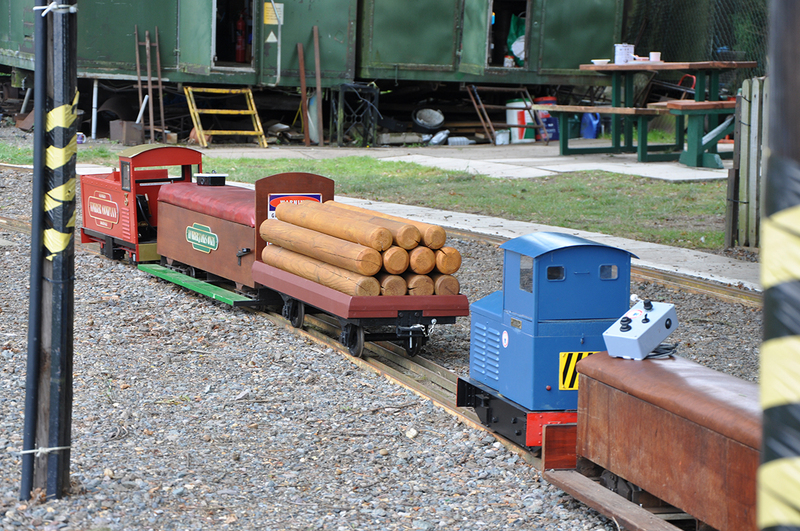 The engines are kept in two well presented purpose-built engine houses, with a separate boiler house with line shaft-driven workshop. 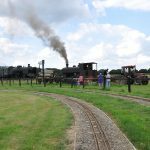 All of these engines are of historic importance, but they include at least one engine of iconic national importance. Namely one of the compound engines from Tower Bridge in London that used to provide power for the bridge’s bascule mechanism. 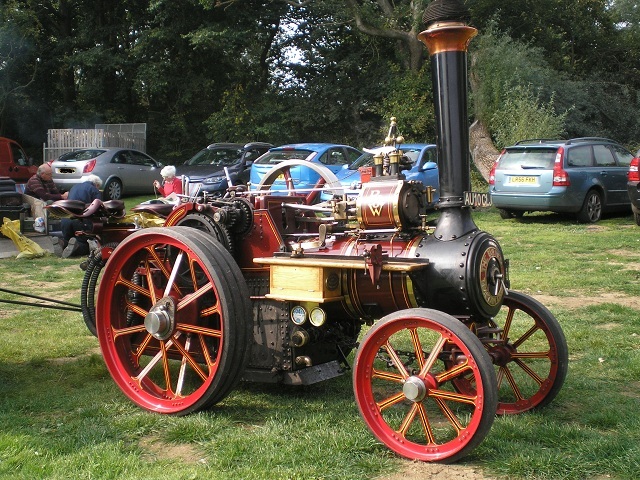 It is seen here at Forncett in beautifully cared-for condition and fully working. 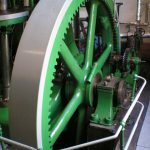 In one engine house you can find the large Dover engine; a Worthington-Simpson triple expansion engine that was used for pumping water for Dover and the surrounding area. 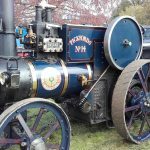 A fine machine that was viewed running; very impressive! 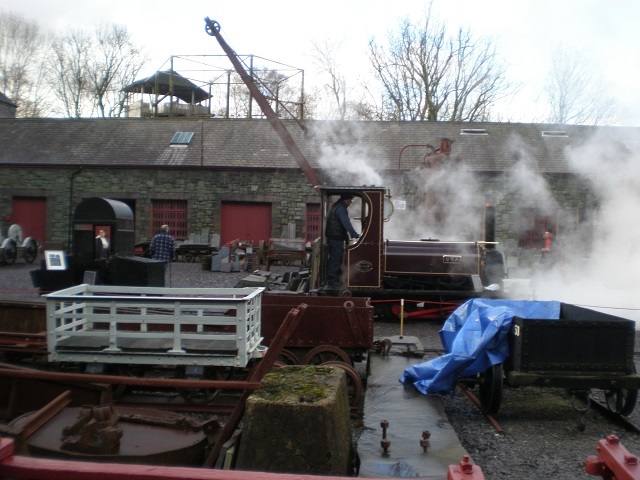 In this same engine house can be found two other distinctly different examples of steam engine. 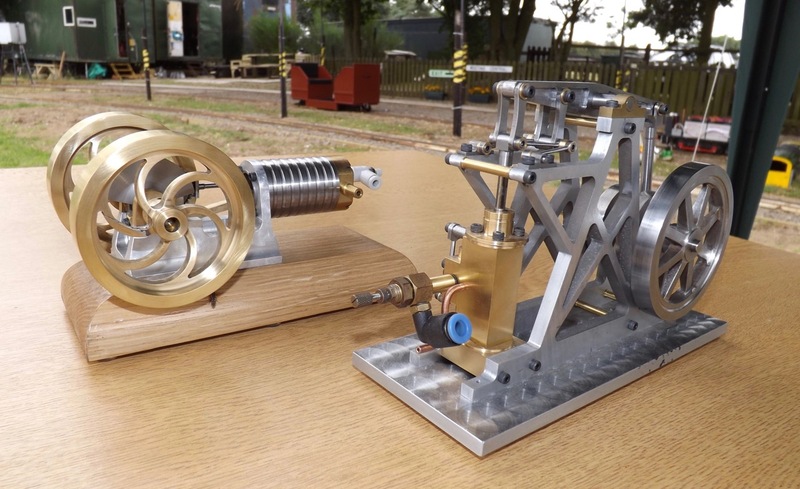 There is a compound beam engine of the late 19th century at one end, and a rare and small example of the Parson steam turbine at the other; a huge difference in technology between them. 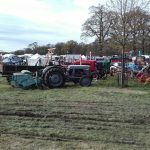 You have to keep pinching yourself that all this lovely stuff is housed in this tiny village, miles from a good main road! The task of getting all this here must have been a truly mammoth one! 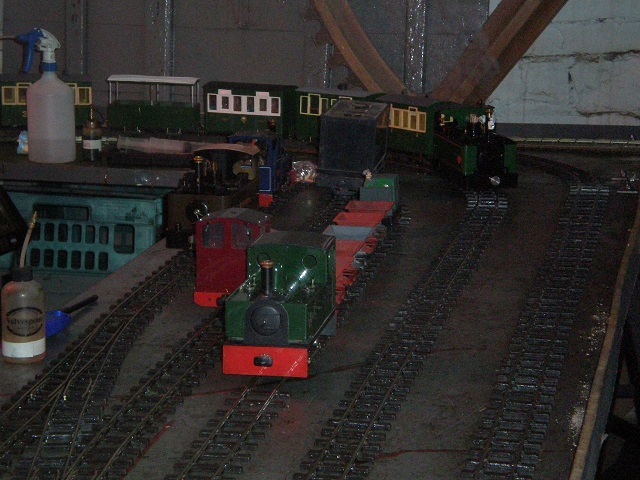 Above the main engine house was a varied exhibition of models including rail, stationary, aircraft, and road steam. Some very good work was to be seen here. 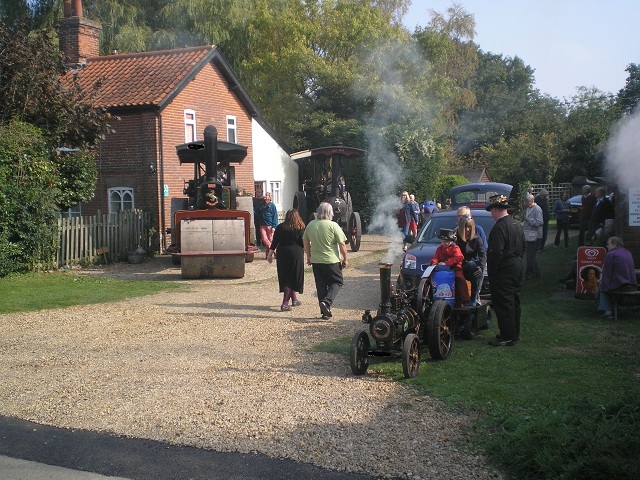 Outside in the glorious autumn sunshine were around sixteen miniature traction engines in steam and chugging about. 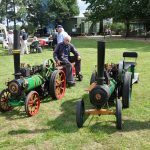 Among them were no less than four club members’ engines.Thee was a good variety of engines present ranging from a 3” scale Aveling tractor, through to a 4” Burrell Scenic showman’s engine, right up to a 6” scale Burrell agricultural with accompanying traction wagon. There were also a couple of full size engines present; an Aveling roller and an Aveling tractor. 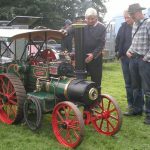 The Aveling tractor had roaded over that morning from nearby Wymondham. 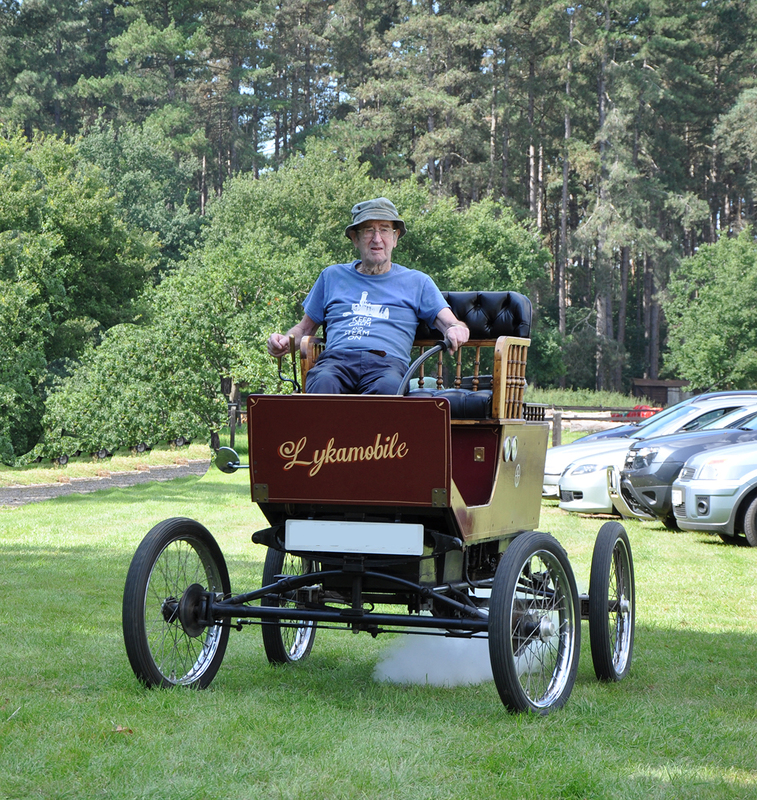 Ray also had his steam car there and steaming around. 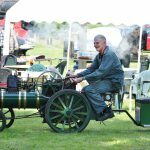 A large array of classic cars was also on display, together with a couple of classic motorbikes, and a small steam launch. 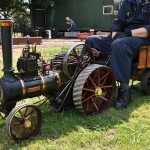 If you haven’t been to Forncett Industrial Steam Museum, you really must! 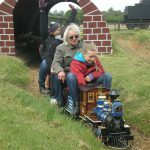 It is a well presented and fascinating place to visit. 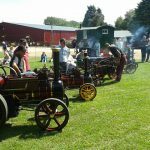 See their website www.forncettsteammuseum.co.uk for more details of steaming days and other events. 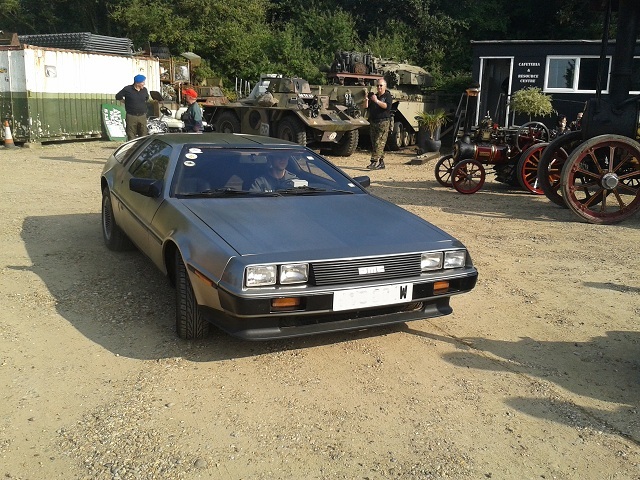 While we were at the Tank Museum of all things a Delorean drove into the carpark, caused more interest than all of the traction engines, mind you I have never seen one either. 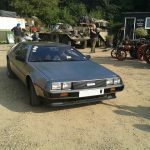 I have since found out that October 21, 2015 (a few days from when this was first published) is one of the dates entered into Marty McFlys time machine in the film Back to the Future! Where’s my “HoverBoard”? Science and Hollywood has seriously lied to us! 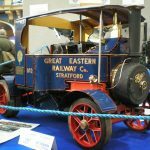 The annual exhibition at Alexandra Palace in London is always a worth looking forward to. With many models and suppliers to explore, it’s also an occasion to see friends and make new ones. 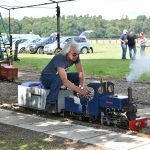 Whilst it can be said that therewas not a huge amount of road or rail steam in the sizes that most of us in theclub play with, there was still a few gems to be found within the selectionpresent. 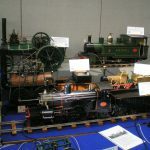 I’m sorry to say that due to my inadequate photography skills and the iffy light in the exhibition hall, I was unable to get many photographs. 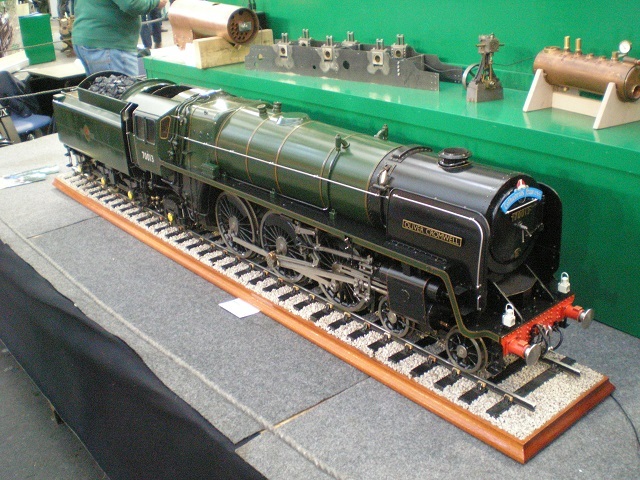 A 5” gauge Bulleid “Pacific”under construction was displayed on a very neat revolving stand. 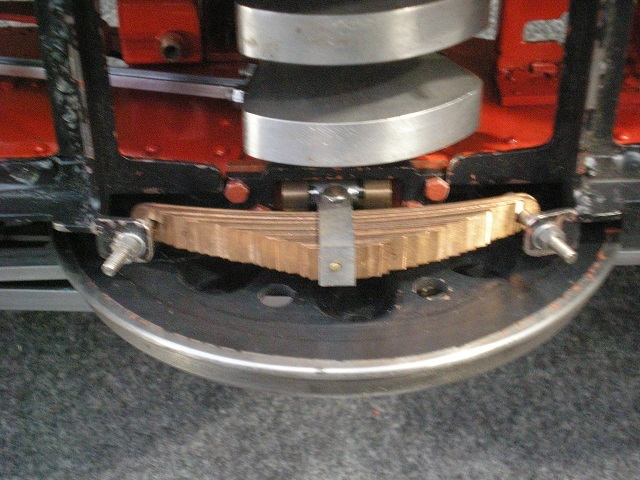 This allowed us to view underneath the loco to examine much fine a fiddly work. 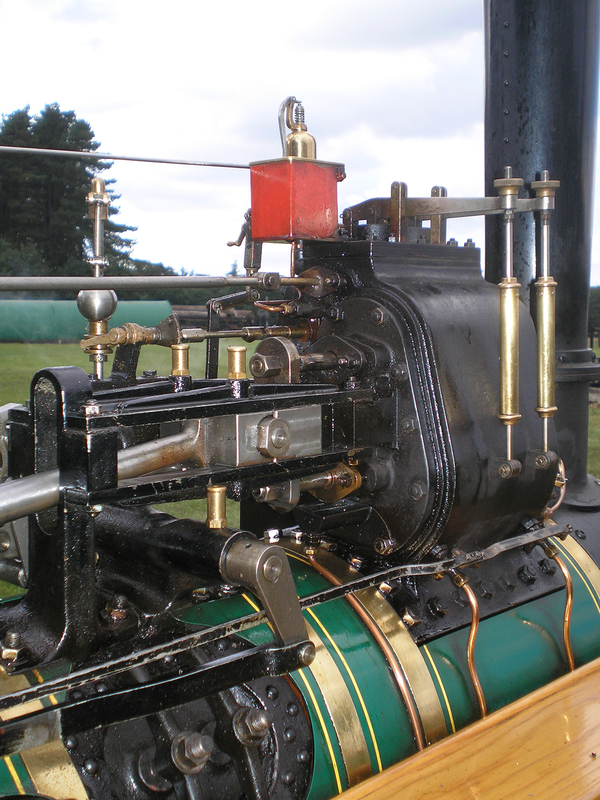 This model is fitted with outside and inside Walchaerts valve gear, with a set of gear for each cylinder. 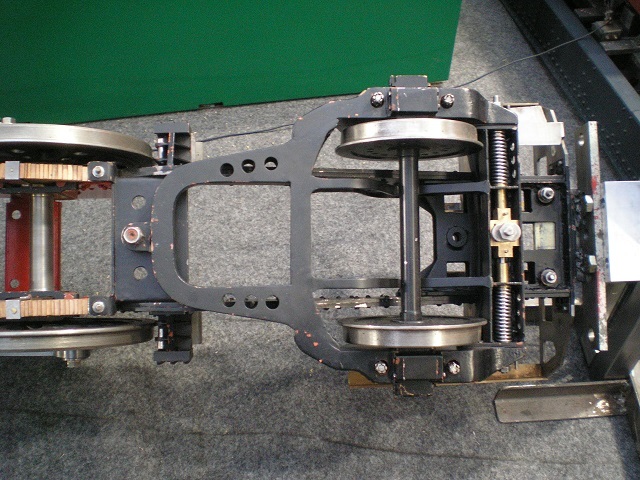 Fine gland construction and springs were noted. 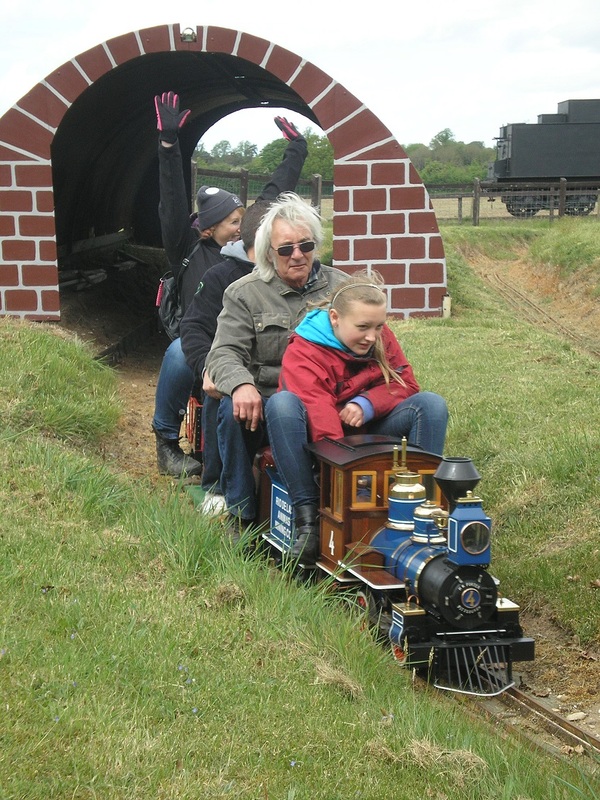 The pony truck as shown from beneath revealed just how much work goes into this part of the loco alone. 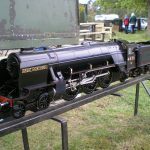 Adjacent to this loco was a very nice 5” gauge BR Class 7 “Oliver Cromwell”. A mighty beast indeed. 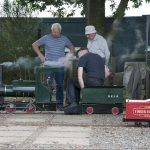 Staying with rail steam, the Gauge 1 boys were once again putting on a great display. 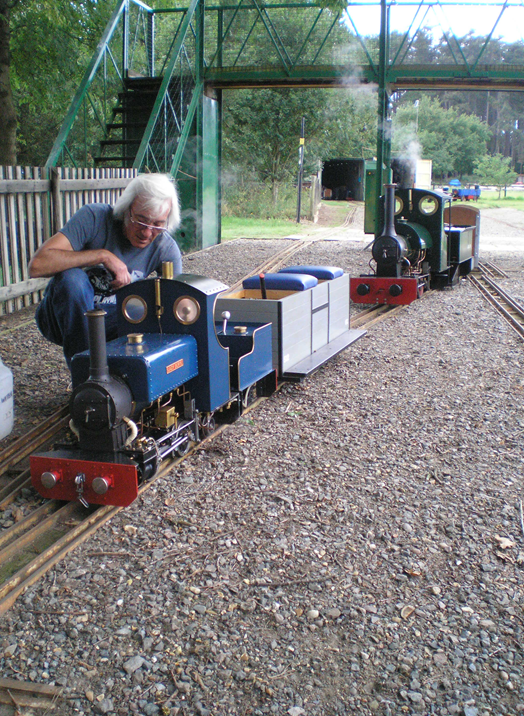 These diminutive meths-fired locos looked great pulling scale coaches and wagons. 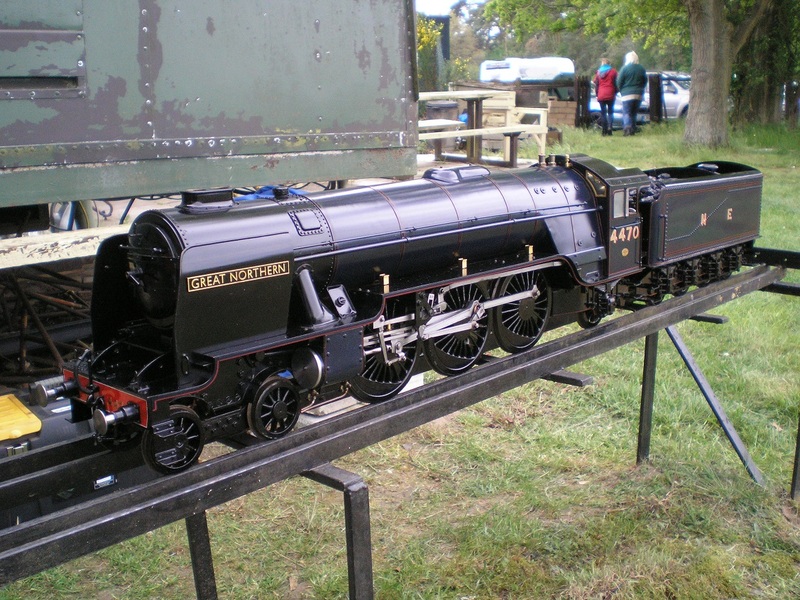 A Stanier rebuilt LMS Royal Scot looked and sounded very nice as it effortlessly steamed around the track. 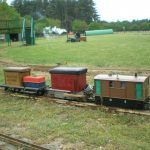 Even smaller than Gauge 1, the OO gauge live steamers showed their miniscule yet impressive locos, with an A4 and an A3 chuffing around the layout in a manner that I’m sure Gresley would have been astounded at! 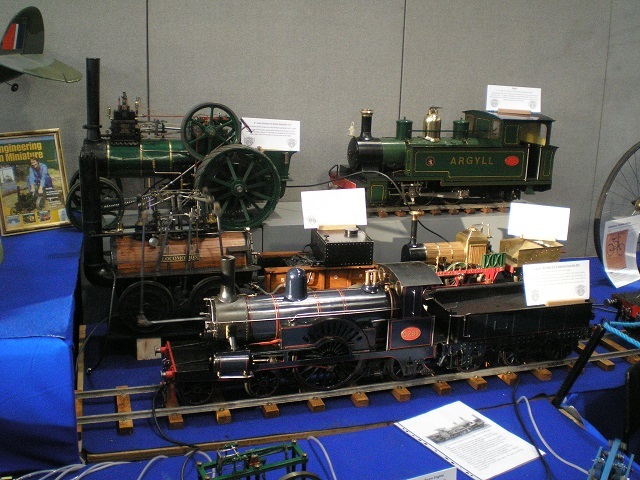 On the other end of the spectrum of gauges was the 10 ¼” gauge Society’s stand. 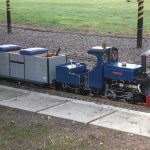 The loco on display this year was a model of a GER G15 tram as supplied to the Wisbech & Upwell tramway, as well as docks around the east coast of the Anglia region. 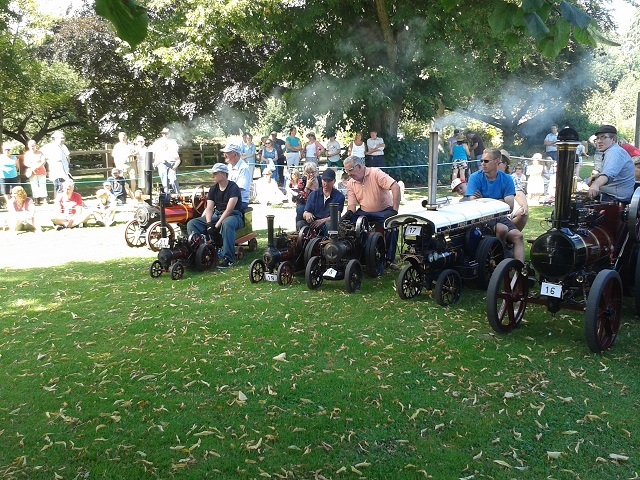 Although powered by electric motors and not prototypical steam, it was a very attractive rendition of these little trams. 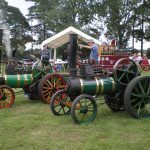 There was not a large road steam contingent present, although there was a selection of engines there. 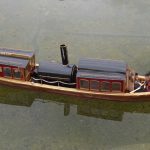 A 4” scale Burrell Scenic showman’s made to the STW kits was finely turned out, as were a couple of 4 ½” Burrell agriculturals. 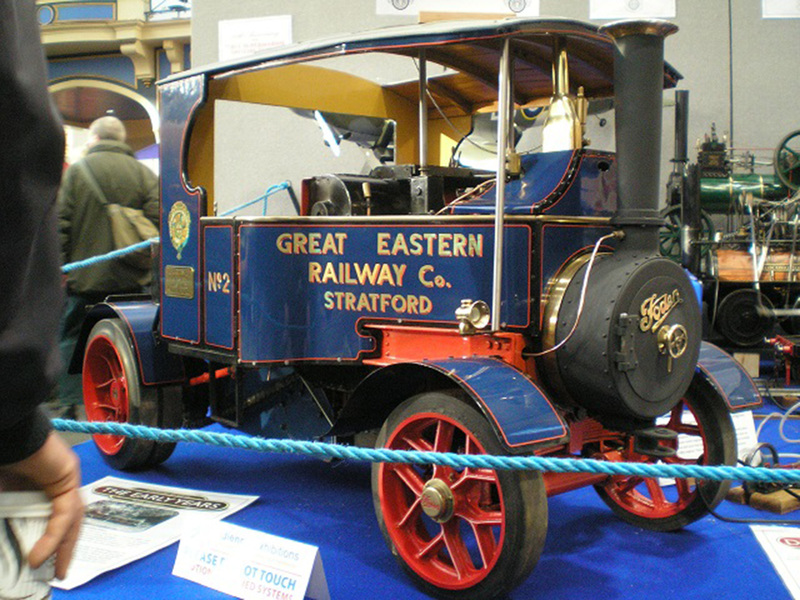 A 3” scale Foden tractor was resplendent in its Great Eastern blue and sign writing. 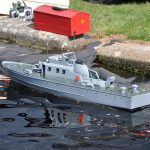 The Tamiya Trucks whilst not on the radar for many model engineers were very well laid out and were happily entertaining the younger visitors…as well as the old! 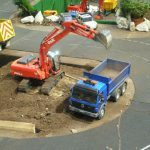 A 360 excavator was seen loading a six-wheel Mercedes lorry with soil. 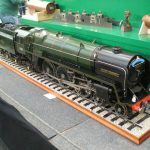 This seemed to captivate many bystanders, including a few that could be described as dyed-in-the-wool model engineers. 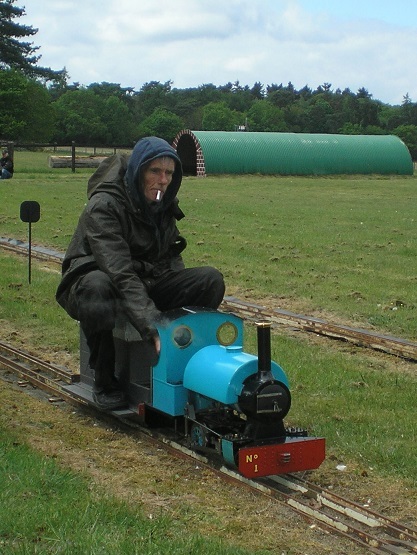 It just shows that we’re all just keen on toys, no matter what they are! 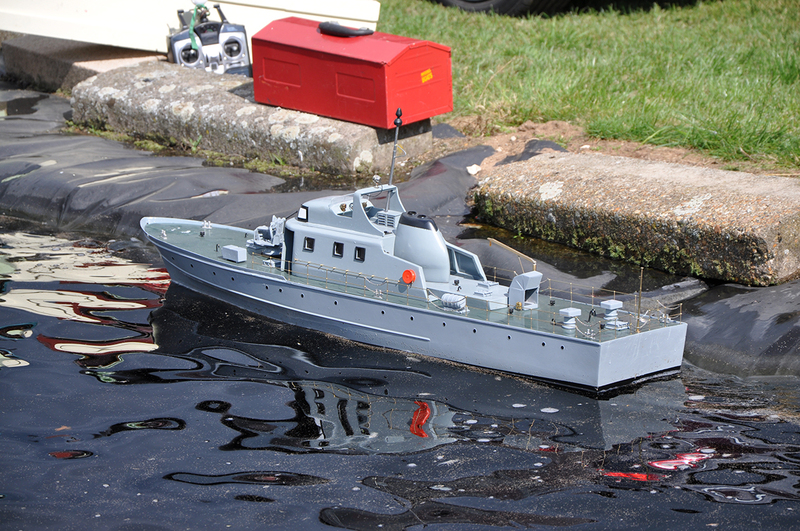 Many model boats were on display, from exquisite model steam launches to battleships and tugs. 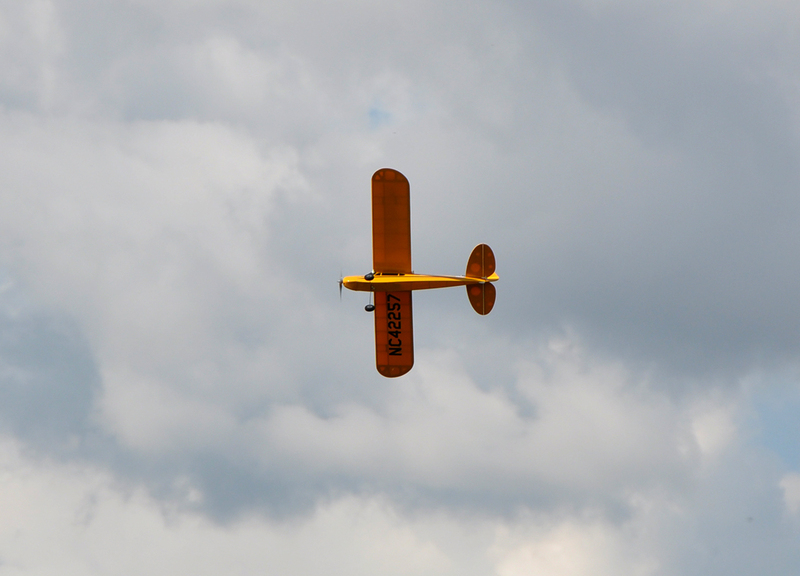 The hydroplane stand was once again showing videos of their craft in action; all terrifyingly fast! 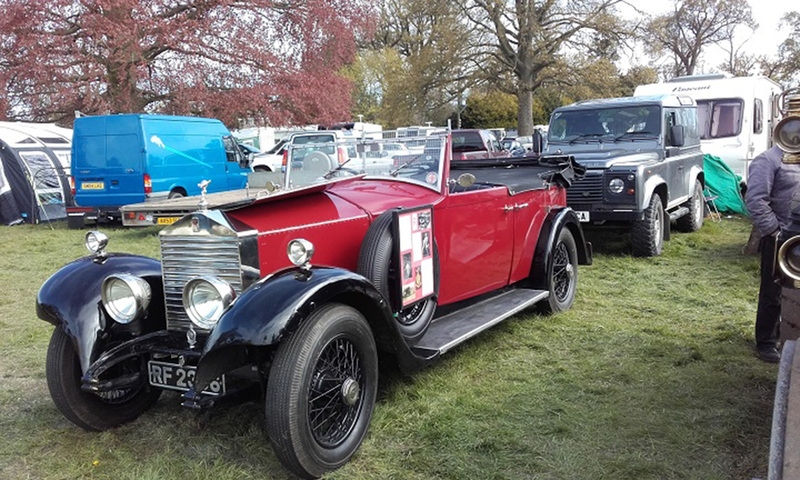 Of the club stands present, one of the best must have been from the St Albans club. 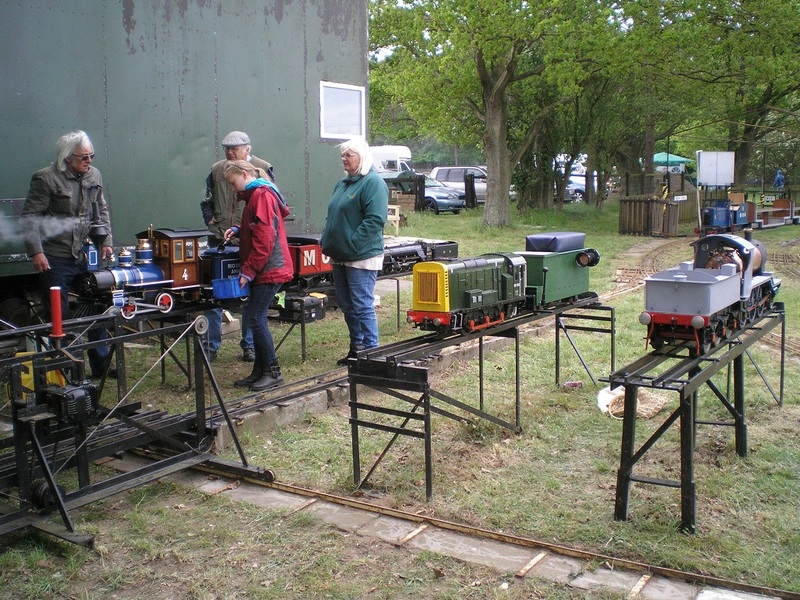 A refreshing diversity of exhibits form standard and narrow gauge locos (one of the best probably being a model of “Locomotion”) to stationary engines driven by hot air, internal combustion as well as steam. A very impressive display indeed. Other things to be seen were several 3-D printers at work. 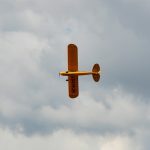 A fascinating technology and one that I’ sure we will see more of in the near future. Ornamental turning and engraving was also on display. 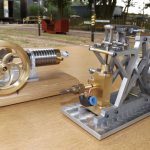 One piece of brilliant whimsy was a machine created to solve real Rubik’s Cubes. 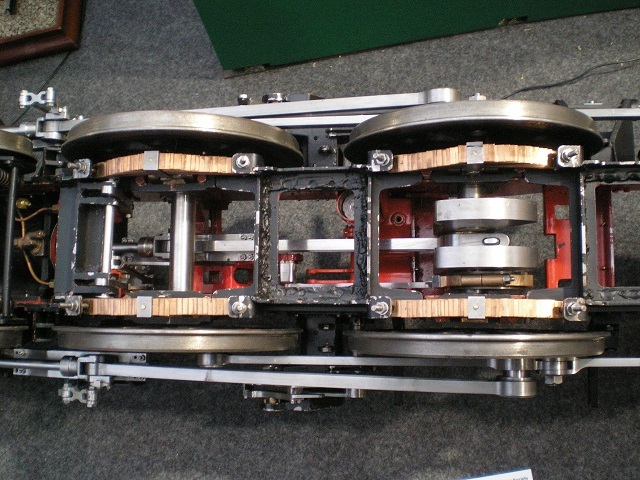 The machine itself was made of Meccano and was driven by a computer and camera combination. Wonderful stuff! 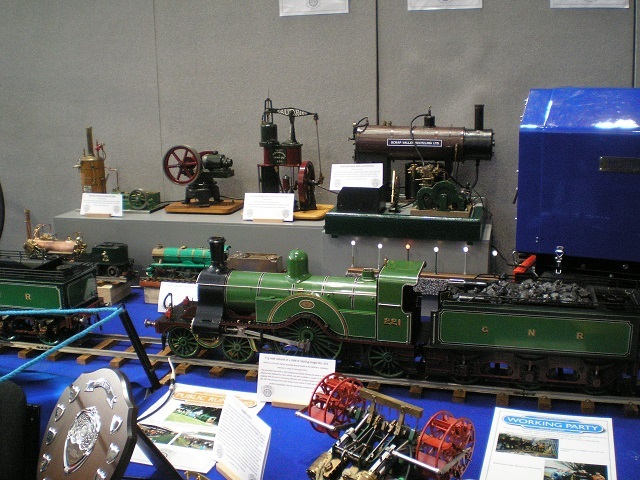 Once again it was a pleasure to see these lovely models and chat with the exhibitors and fellow visitors alike. 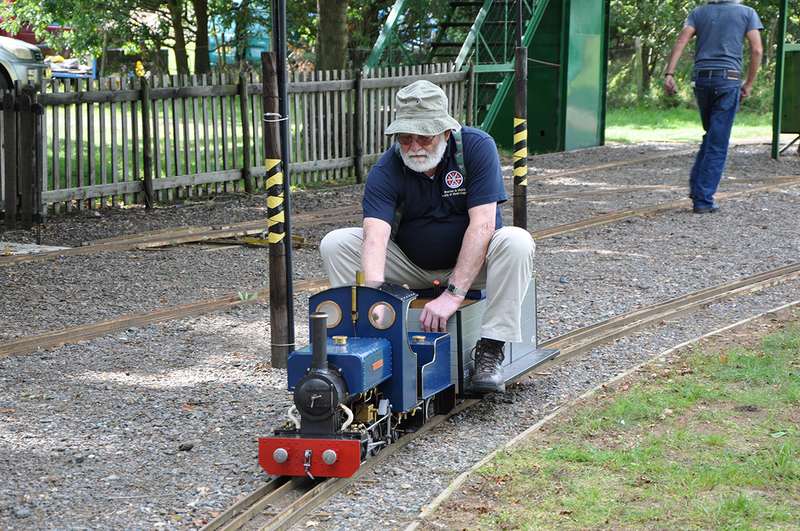 “What has a railway event in North Wales got to do with our club here in sunny Suffolk?” I hear you cry. 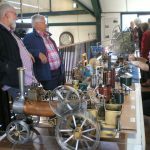 Well, over many years now I and other club members have attended and exhibited at this exhibition. 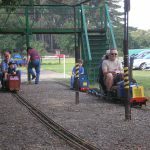 Locos of various gauges have been displayed and used here including steam, petrol and electric. 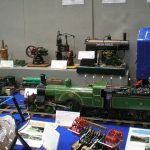 I exhibited both my model Burrell Scenic showman’s and my Burrell agricultural engine at shows here in the past. 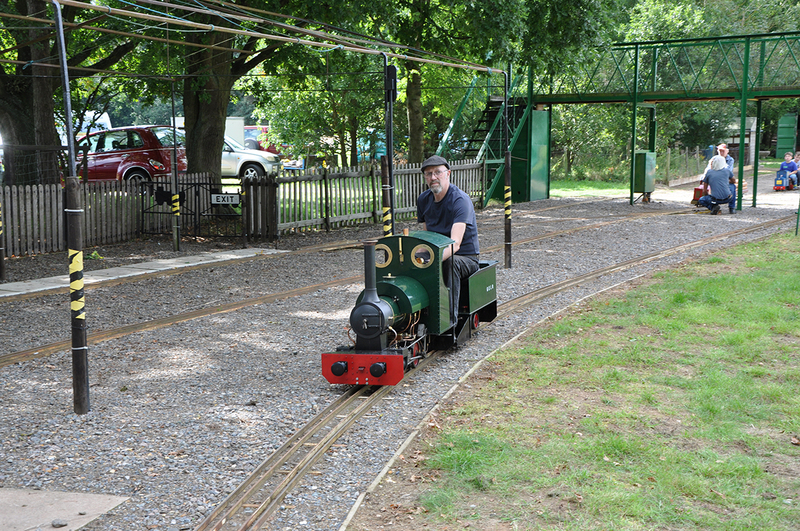 One of our club coaches even had its test run here about twelve years ago! 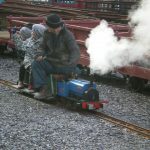 Hosted by the National Slate Museum at Gilfach Ddu near Llanberis, between the Snowdon and Elidir mountains, it coincides with the half-term holidays. This is indeed a majestic setting. 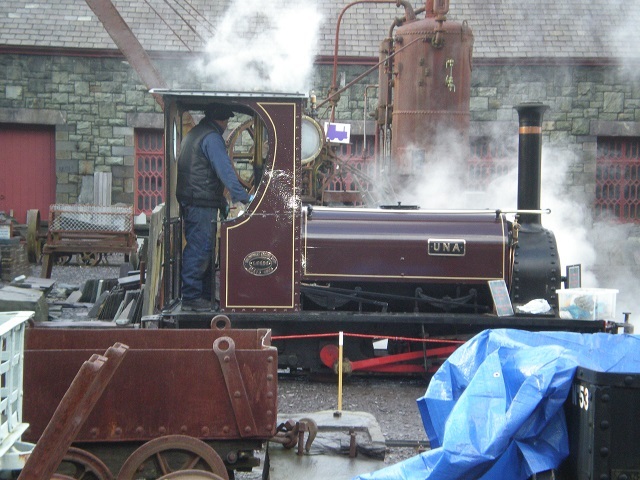 The museum is housed in the workshop buildings of the old Dinorwig slate quarry, and it is a fascinating place to visit. The quarry closed in 1969 and the museum was established soon after. 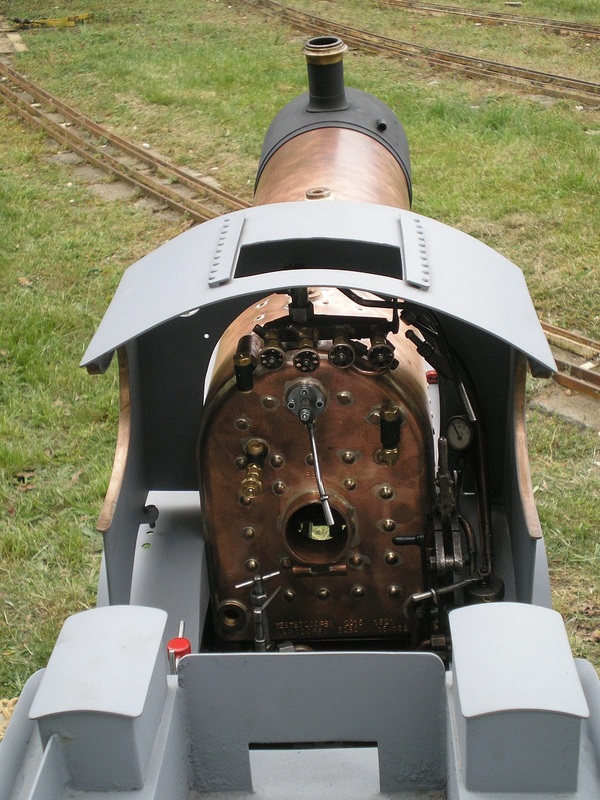 Much of the original equipment is still in its original location. 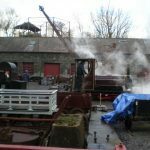 This includes the machine shop, pattern shop, forge and foundry. 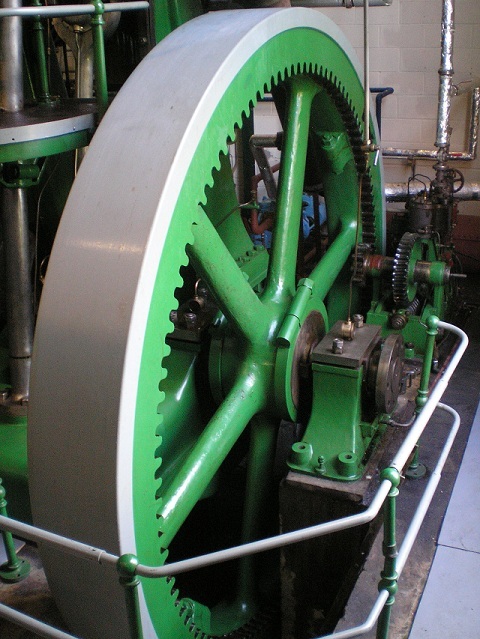 Power for the machinery came from a 50’ waterwheel made in Caernarfon by De Winton & Co (of vertical boilered loco fame!) and a lot of line shafting! 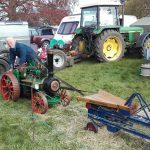 The big waterwheel was made redundant when a smaller but more efficient Pelton waterwheel was installed. 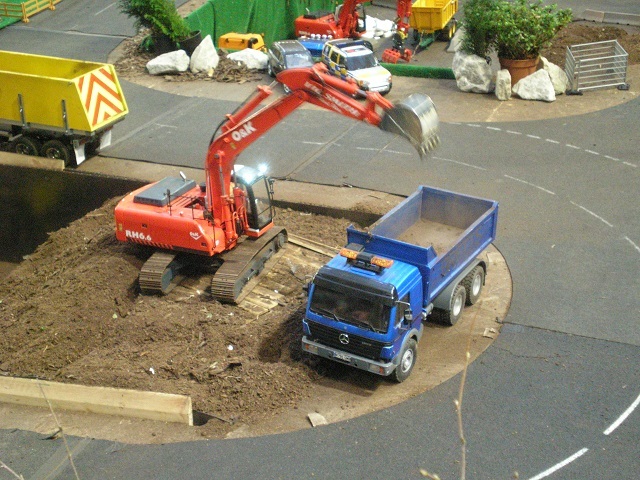 The De Winton wheel is still in situ, it still turns and you can walk around it; very impressive! Everything for the quarry was made here. Even the window frames had their patterns made here and were cast here, too. 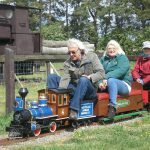 A brilliant place to visit if you’re in the area. 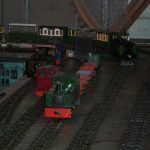 The railway exhibition this year included some lovely scenic layouts in OO gauge, a great 16mm layout with many narrow gauge steam and battery electric locos running, and a 5” gauge railway giving rides outside. 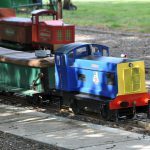 The museum itself owns a collection of very nice model locos, including a 5” gauge Quarry Hunslet. 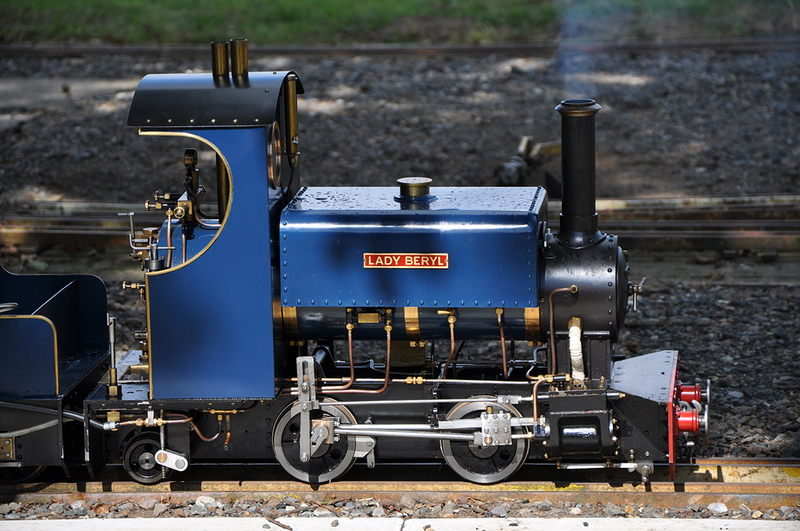 This model is based on a class of engine similar to the museum’s full size Quarry Hunslet “Una” of 1905. 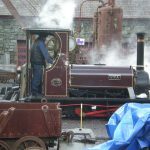 Many engines similar to “Una” were to be seen working here at Dinorwig during the quarry’s working days, chugging about up on the galleries of the mountain itself. What a sight they must’ve made! 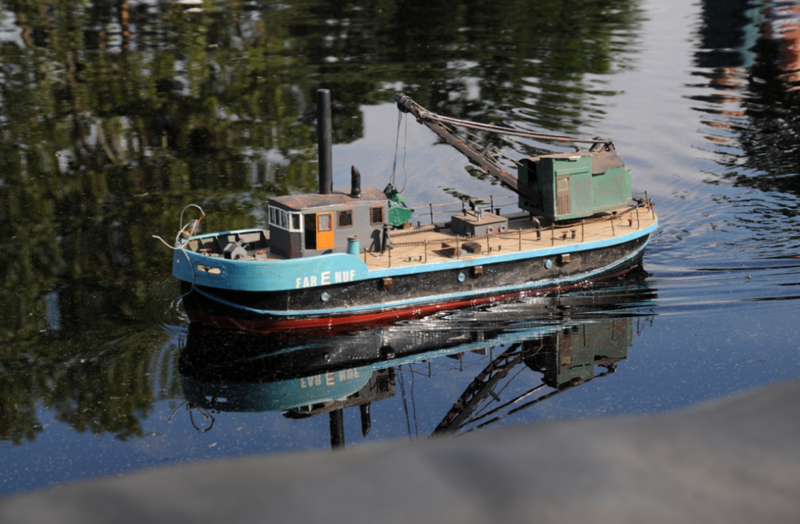 “Una” was in steam during the model exhibition and looked just right in her industrial setting. 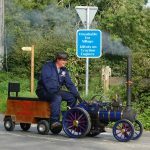 A few years ago I had a ride on the new section of the neighbouring Llanberis Lake Railway on the footplate of this great little engine; brilliant fun! 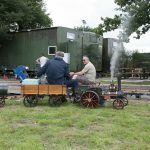 The event was accompanied by some typical Welsh weather so it was difficult to get many photos of the goings-on outside. However the damp conditions did make it very atmospheric! 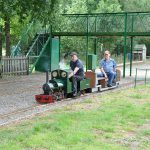 We all had a great time here, talking to the visitors and enjoying the company of the museum staff, many of whom are ex-quarry workers. 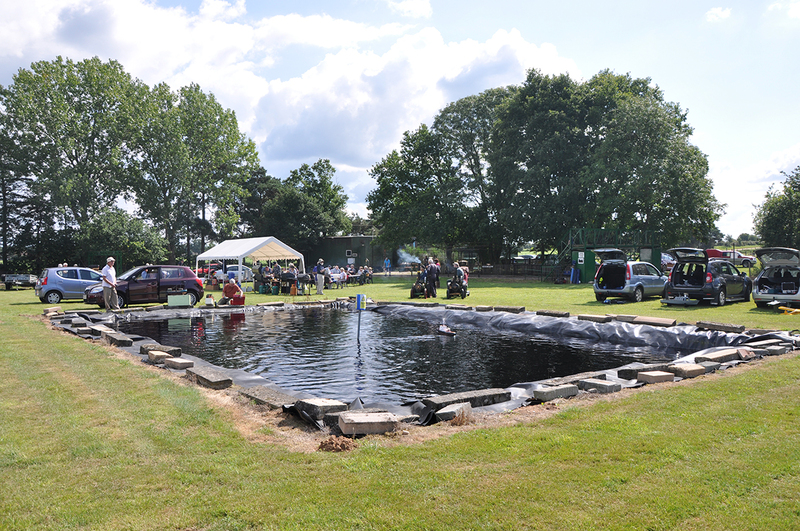 Demonstrations of slate dressing and splitting were seen and I’m always impressed with the skills on show. It’s incredible to think of the thousands and thousands of slates a man would’ve split in his working life. My thanks to Paul and all those who made this such an enjoyable event. 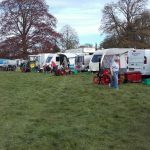 Now that we are caravan owners, please try to keep the sniggers to a minimum! 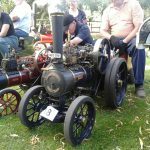 we have decided to visit more local rallies/gatherings with our 3” Traction engine “Scallywag” one that came to mind was the Stradsett Rally, held on the first bank holiday weekend in May. So back in darkest January we sent off the downloaded form, which was obtained from the clubs excellent website (www.nvtec-ea.org.uk/rally/) and sometime later an entry pass and guidance paperwork dully arrived in the post. 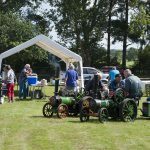 Indecently they also provide an excellent hog roast on the Sunday night for a minimal cost, pre-booking is essential for this, it’s extremely popular! 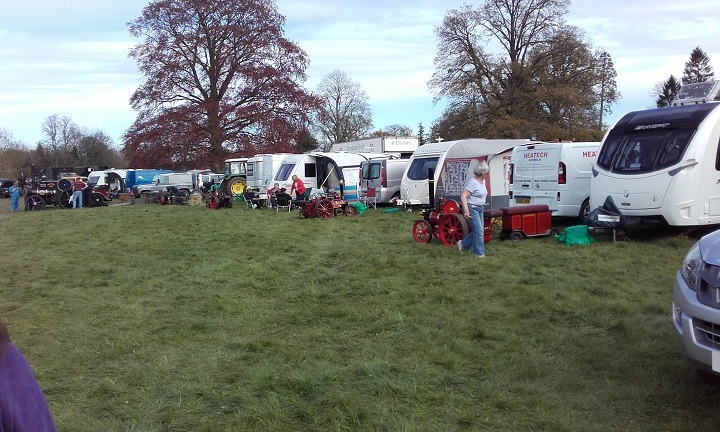 The rally field is a lovely area of parkland attached to Stradsett Hall, if you know the area it’s behind the Foldgate Pub on the junction of the A1122 and the A134, a terrible junction and well known accident waiting to happen, and it did over the weekend….. 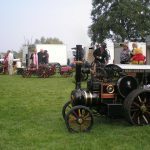 Unusually the rally runs from Sunday to the bank holiday Monday, this is ideal as we could take the caravan down on the Saturday morning set everything up and nip home to retrieve the engine later on in the day, yes I am stuck with the dreaded “Double Hauling” one day we will get it sorted out. The great advantage for the Stradsett rally is it’s only about twenty five minutes away from home, making multiple trips not such a chore. 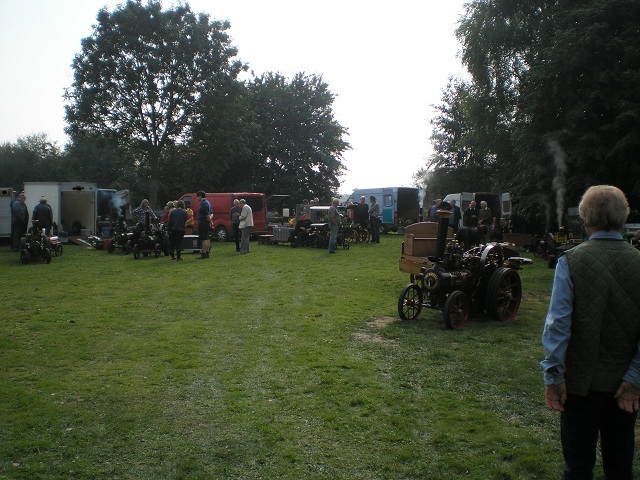 First impressions were that while it’s not quite as big as Weeting, more the size of Strumpshaw, there is a huge range of exhibits present from Stationary engines, tractors/farm machinery to steam engines, vintage cars/bikes just about everything you would expect to see on the rally field. 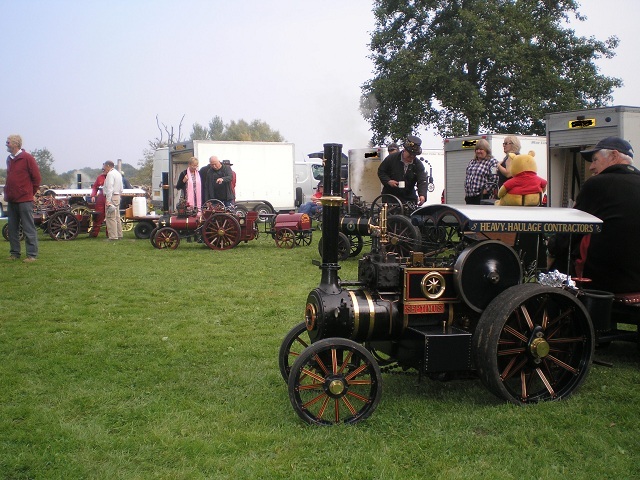 Steam is one of the smaller sections with only about 10-12 engines on show, interestingly there was a blue Pickfords tractor, Mick with his blue 4.5” Burrell and us with the blue 3”Minnie meaning that blue was the most common colour! 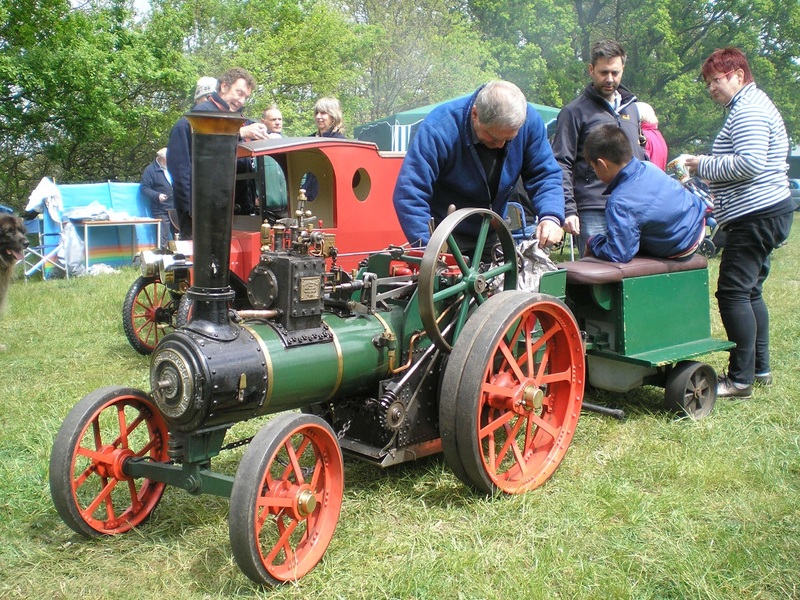 Now that doesn’t happen often, Norman S and Steven came along as well, giving the bailer some exercise often attracting a large crowd of onlookers. 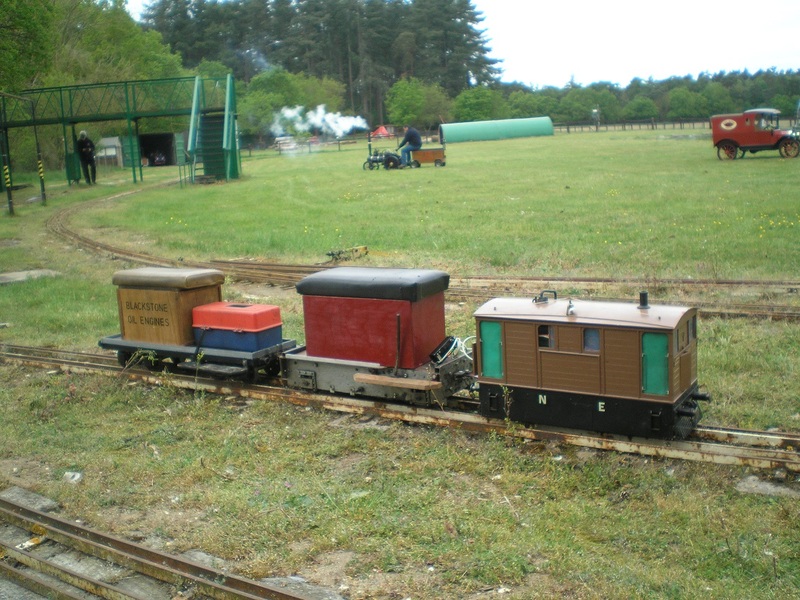 Interestingly miniature steam was allowed to roam pretty much freely, whereas everything else was strictly tethered to the “Peg” unless on the way to the ring. I used to work in Kings Lynn and it was lovely to bump into old friends, some I haven’t seen in fifteen odd years! So it was good on that front as well. 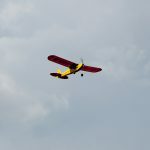 The rally has a reputation for being extremely friendly and this was born out by the stewards who couldn’t do enough to help, I was asked several times if everything’s OK? Do you need a hand? Etc. 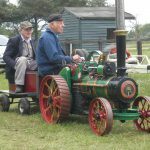 While loading up the engine in the rain, Sharron and I were struggling getting it back on the trailer, a passer-by asked if he could help and in no time it was lashed down and ready for the road! At most rallies it seems to be everyman for himself, at the end of the day, doubly so if it’s raining! Really impressed to have some impromptu help! 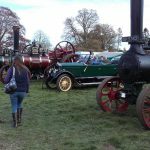 It seems that getting on to the site this year was somewhat of a problem Hugh said he and the misses had queued for an hour and a half to get in the gate and about the same amount of time to get off again, it really was a popular show. The dreaded Foldgate pub junction kept to its side of the bargain and I gather there was a coming together of shiny paintwork, which neatly removed the front wheel and suspension from a passing BMW! I understand no one was hurt! 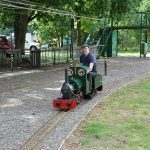 Would I go again? A definite YES. The weather held until the end of Monday, we awoke to a glorious sunny and frosty Sunday, with the wife moaning she was cold! Had to turn the central heating on! 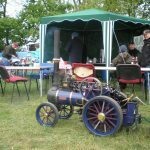 Now you don’t get that in a tent, I am warming to this caravaning lark, I must be getting old? 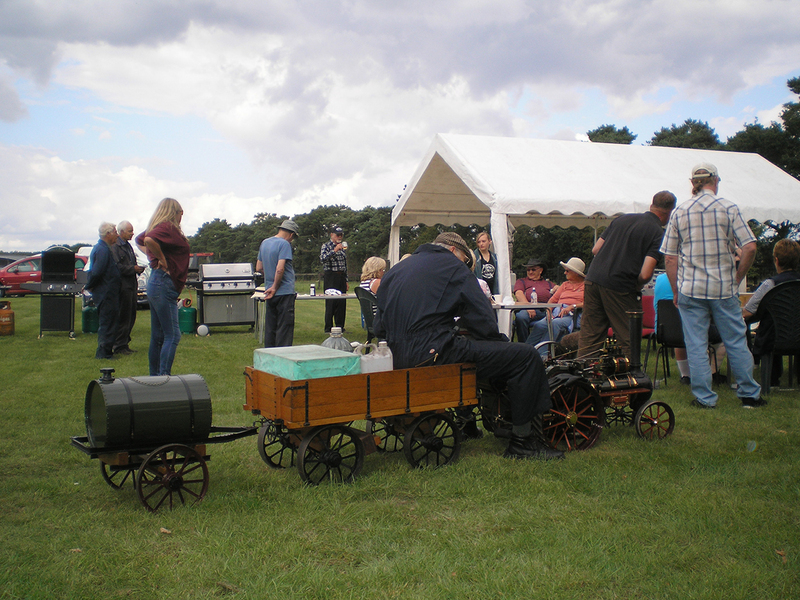 The grey and dreary weather was not a promising start to our Invitation Day held at the track at Weeting. The showers persisted on and off throughout the morning, but happily they subsided after lunch. 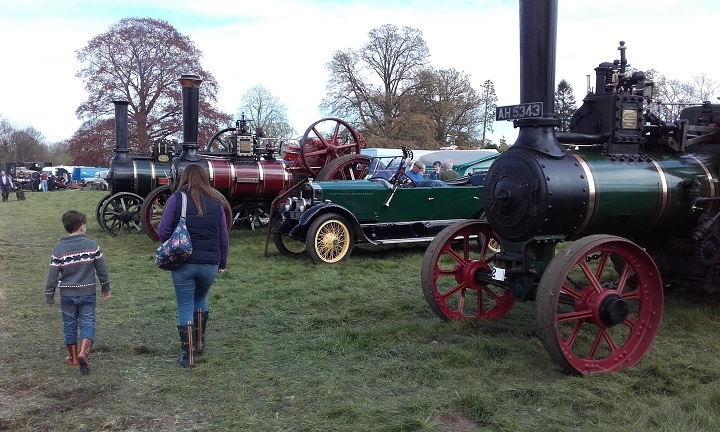 True to form the dodgy weather failed to deter many members from bringing their engines along, and we had a good turnout of road and rail engines. 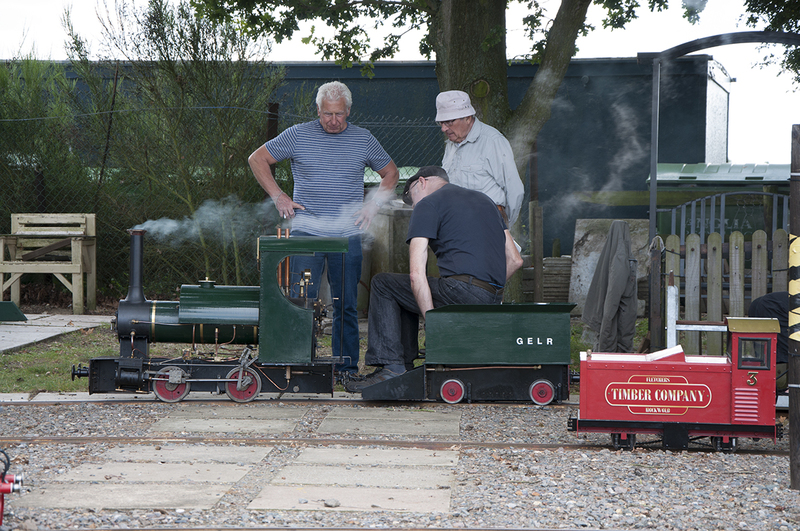 Mike H’s expression below sums up the determination of members to play with their engines whatever the weather! 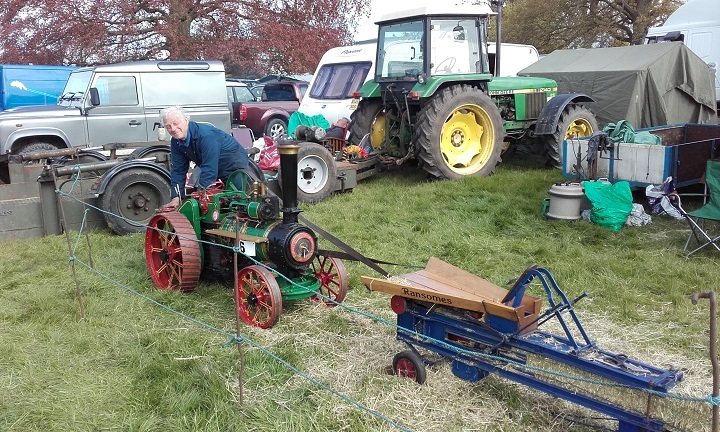 His 3″ Burrell agricultural was enjoying one of its first outings since he acquired it a subsequently set about turning it in to the beautiful engine we saw today. 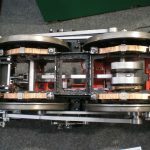 Serious work on the crank and other components now mean that it ticks over like a Swiss watch. 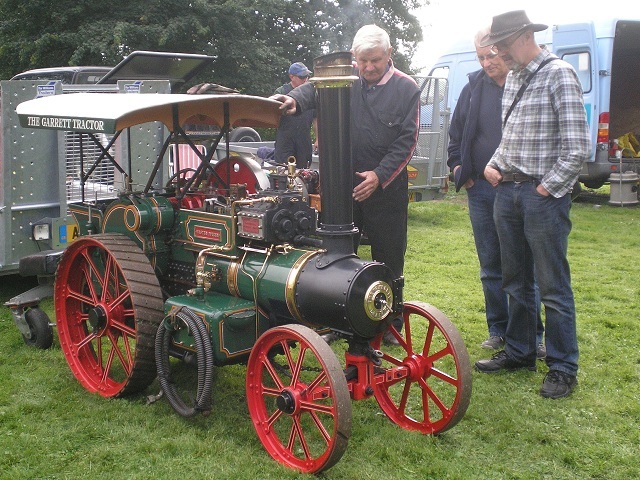 Another 3” Burrell seen below was present, this being owned by Mike’s nephew I believe. 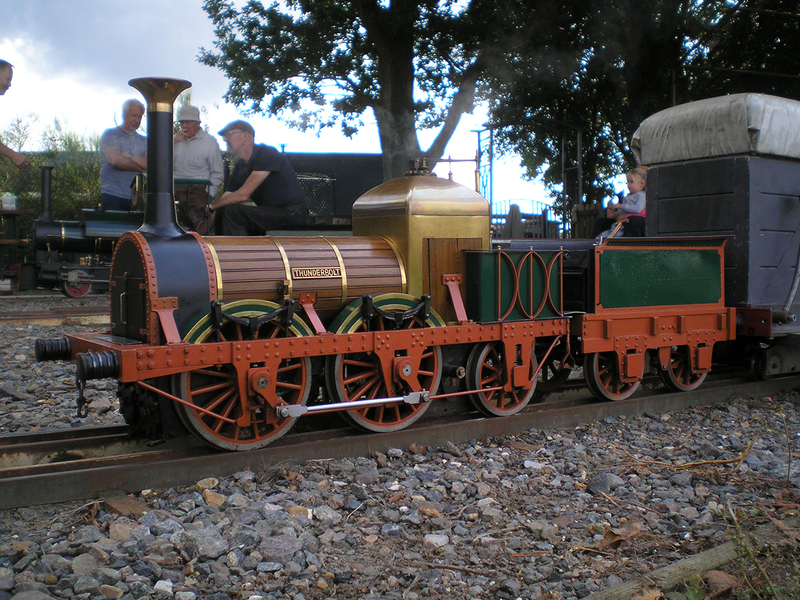 This was running very well, and always had a good head of steam whilst chugging around the site. 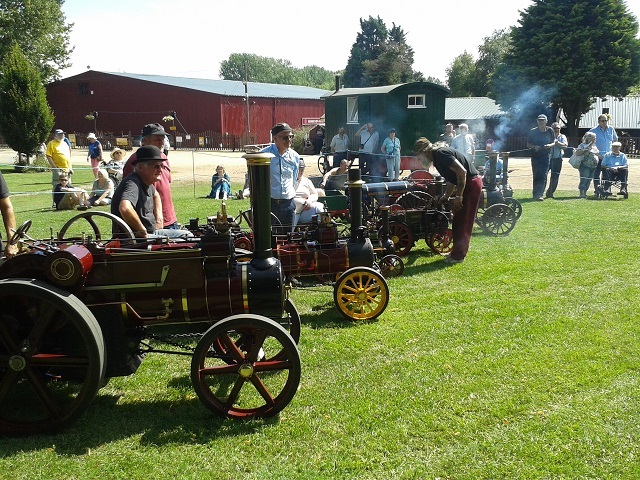 The road steam contingent was also made up of Norman’s 4″ Foster agricultural, Andy’s 4 ½” Burrell agricultural, Mike B’s 4″ Savage tractor, Chris’s 3″ Minnie “Scallywag”, Stephen’s 4 ½” Burrell (on display though not in steam) and Ray’s Lykamobile steam car. 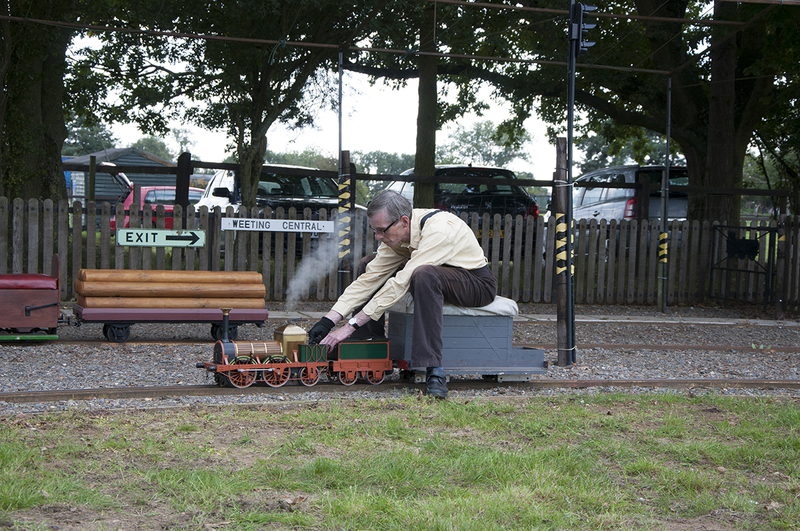 There was activity on the track, including Pete, our regular visitor from the Peterborough club with his 5″ gauge Wisbech & Upwell tram. 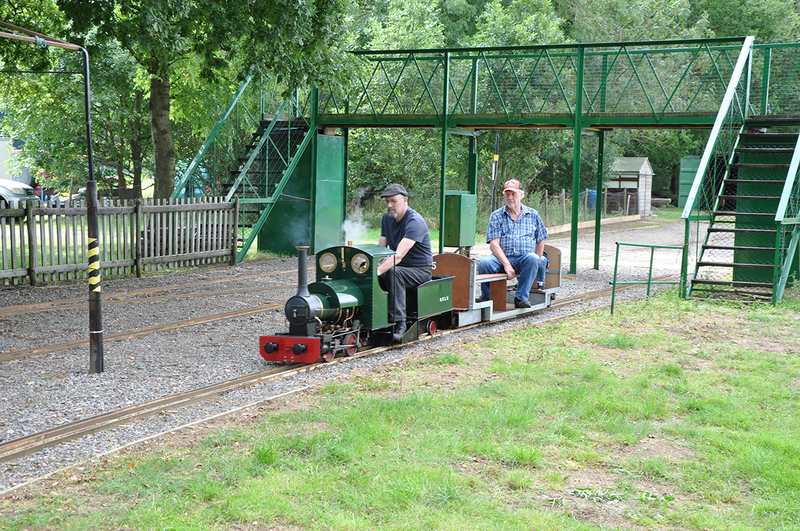 Pete had also encouraged a few other Peterborough members to visit us today, and we all hope that their enjoyed their visit. 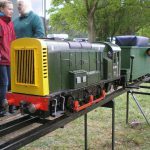 Jason was also seen with his latest creation, a 7 ¼” gauge Sentinel shunter. This was one of the engine’s first trips out, and looked very smart indeed, with very crisp and neat bodywork. 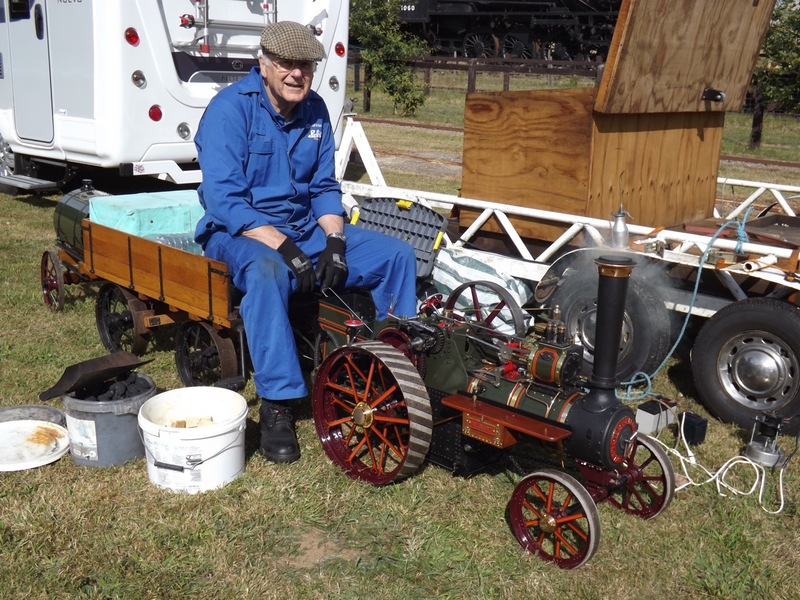 He certainly seems to be well pleased with his efforts!Paul S had brought along his 7 ¼” gauge Sweet William “Sambuca”, and a lovely train of narrow gauge slab wagons to compliment this cracking engine. You can see that he has learned from the best and was fully equipped with willing “staff”! Very handy!! 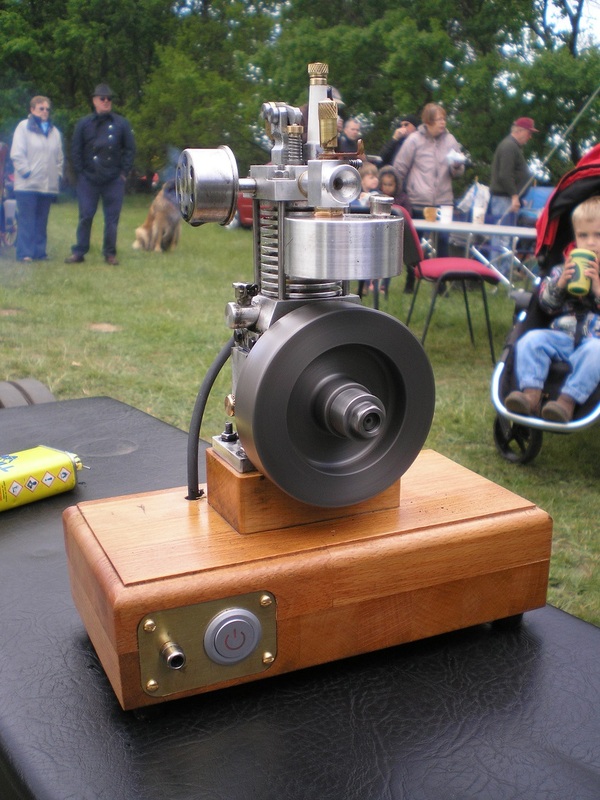 Paul B had brought along one of the Simplexes he is working on, and his half-size Gardner gas engine. 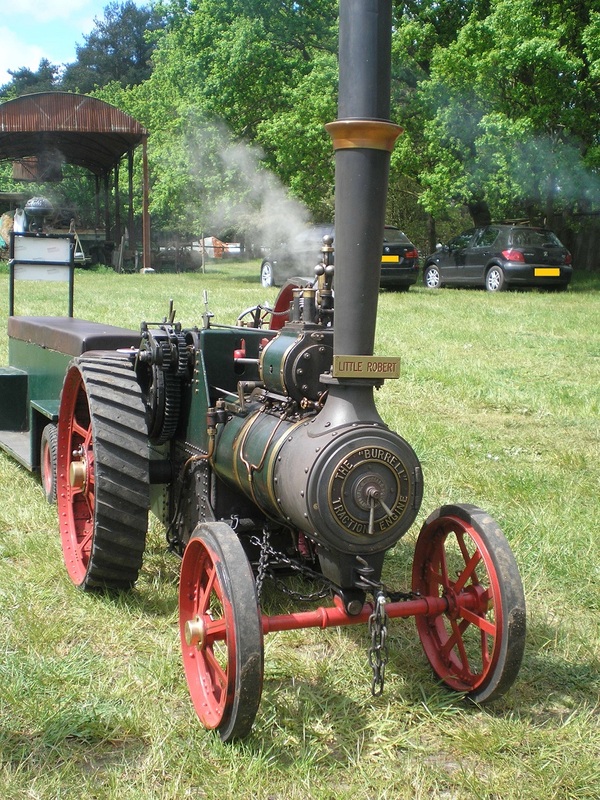 The Gardner runs so smoothly and is a joy to watch, with its soft rhythmic exhaust. 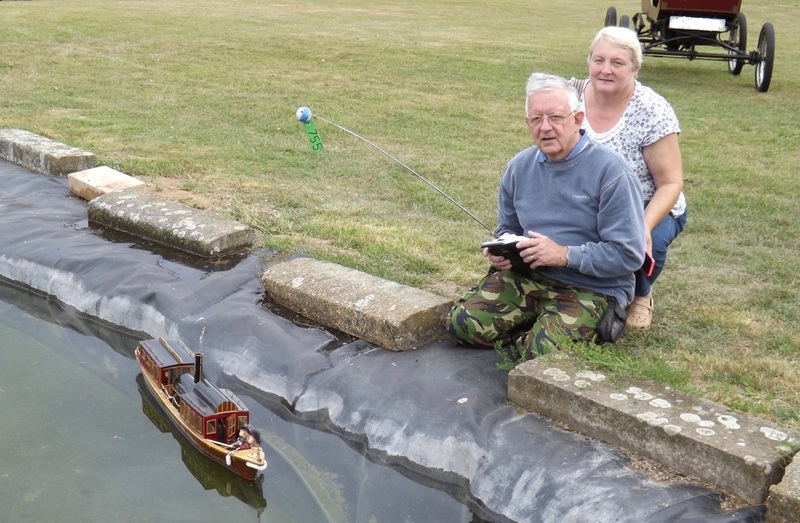 Young Sam had his model boat on the pond, and like some of the other youngsters present, had a plethora of radio control vehicles to play with. 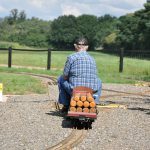 This just goes to show that we are all just playing with toys, no matter what our age is! 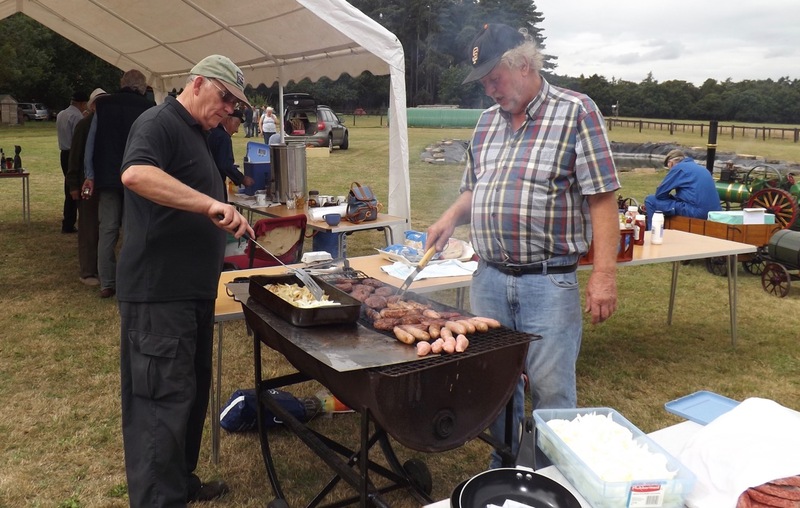 The BBQ was expertly tended to by Stuart and members of his family, and was very popular indeed. 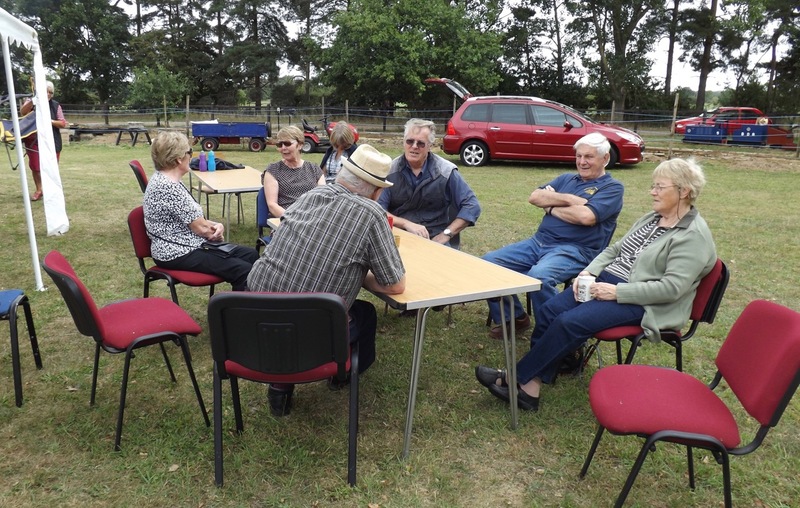 With our now traditional High Tea served later in the afternoon, I think it is fair to say that everyone was well fed and watered. 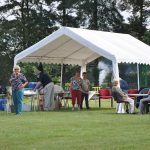 Our thanks go to all those who provided cakes and nibbles, and to those who worked so hard in the catering department to help make this day so enjoyable. It was a delight to see life member Eric among us again. 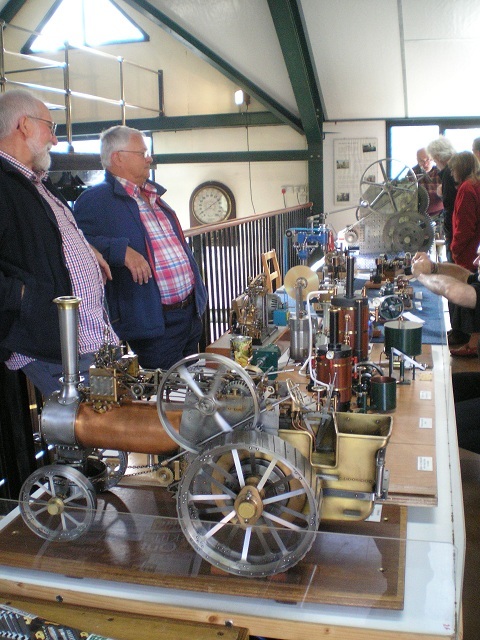 He chatted with many of those present, and was chauffeured up to John’s boiler house by Andy’s Burrell to see the big stationary engine in steam. All in all it was a great day, despite the iffy weather in the morning. 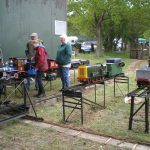 Once again our thanks go to all those who helped make today such a successful and pleasant event. 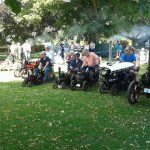 With the country experiencing some of the hottest weather of the year in early May, we had high hopes that the weather gods would smile favourably on us for our Invite Day. As it happened, the aforementioned meteorological deities must’ve had the day off, as the day proved to be a bit on the windy and chilly side, with only a rare appearance on the sun. 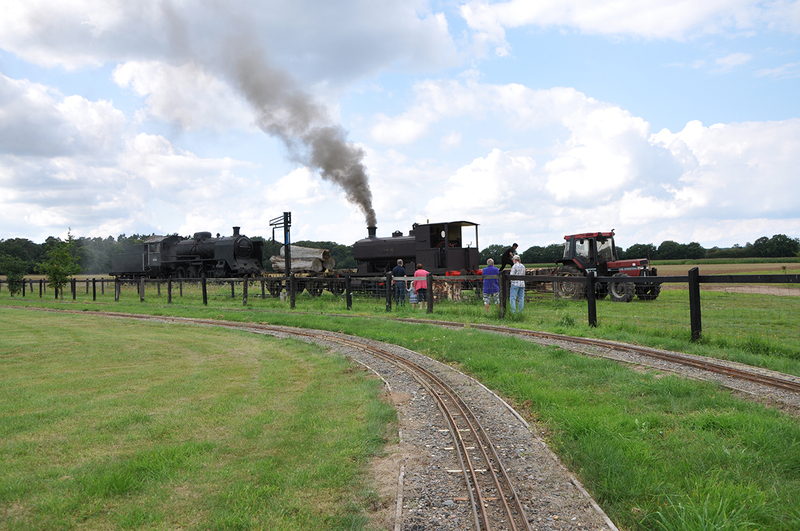 But, no matter, as we saw many engines and visitors come along to enjoy this day. 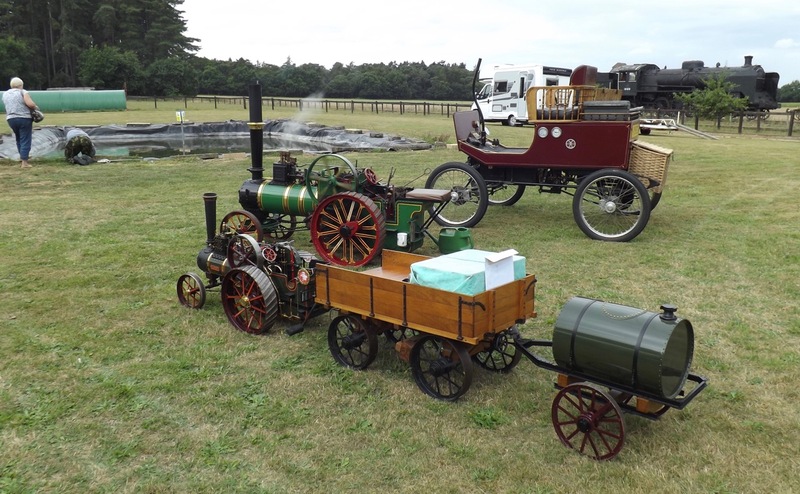 The road steam department was well attended, and was complimented by Geoff B’s lovely model Ford Model T van that was seen running around the site. 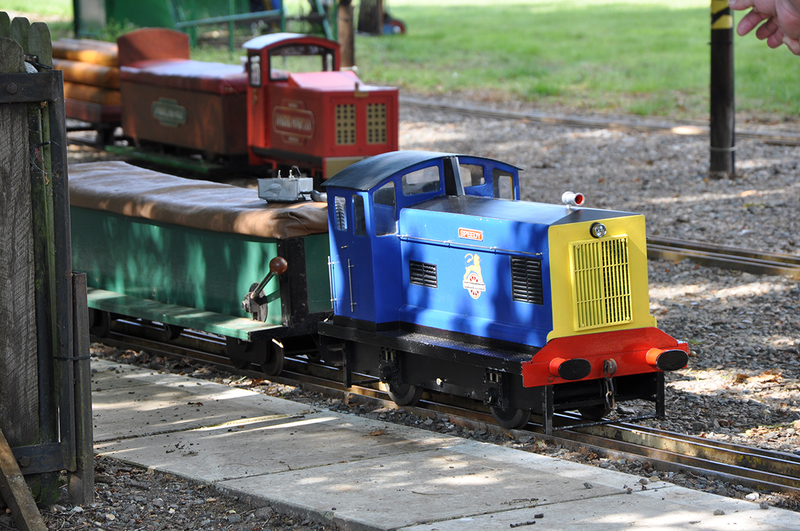 Andy has now officially named his 4 ½” Burrell agricultural “Little Robert”, and it was seen sporting it’s new nameplate that Andy made himself. 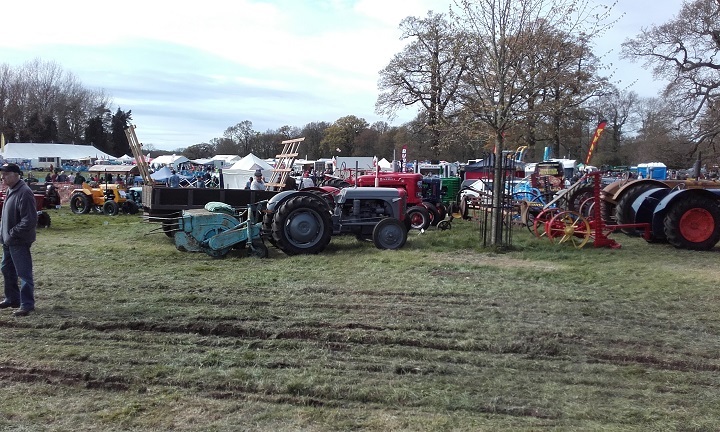 The rubber strakes to the hind wheels improve driving comfort on the road whilst maintaining it’s agricultural appearance; really smart! 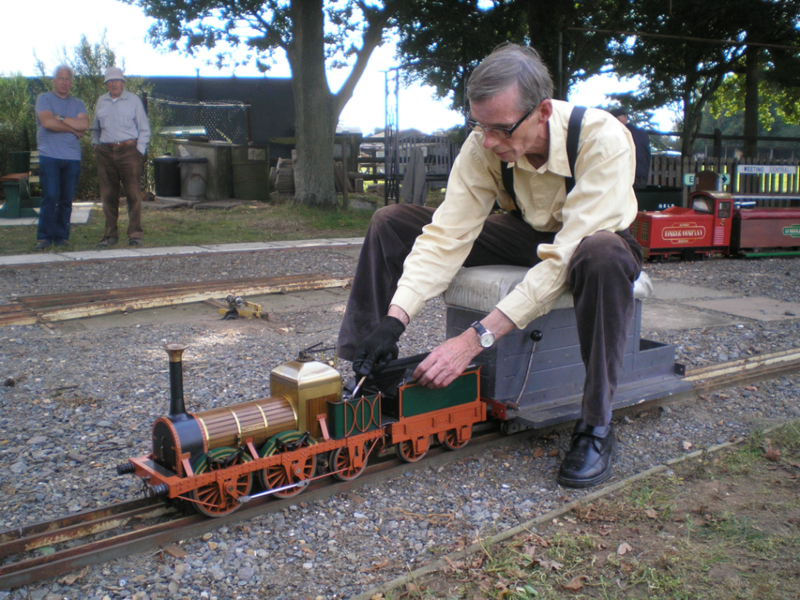 Alan was seen preparing wife Marian’s 4 ½” Burrell agricultural for her arrival. 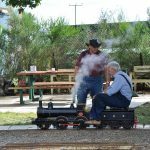 I’m assured that everything was present and correct when she arrived, with plenty of steam, fire, and water. 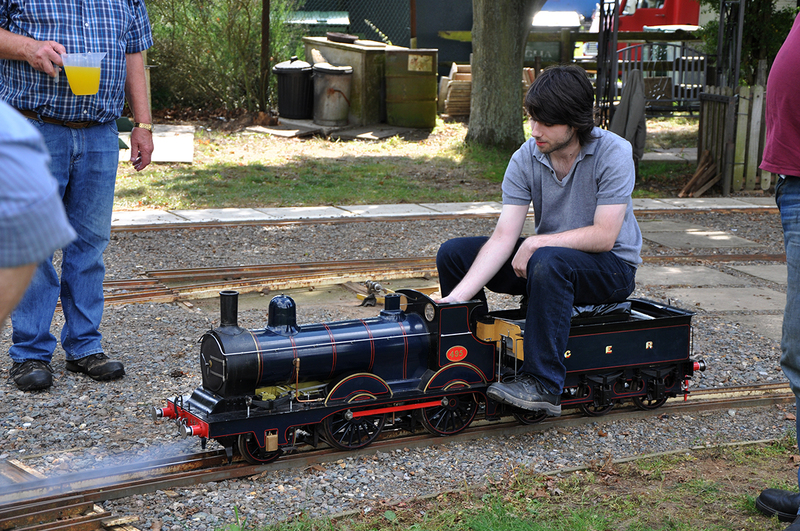 Fingers crossed he’ll get his steam apprentice ticket signed soon! 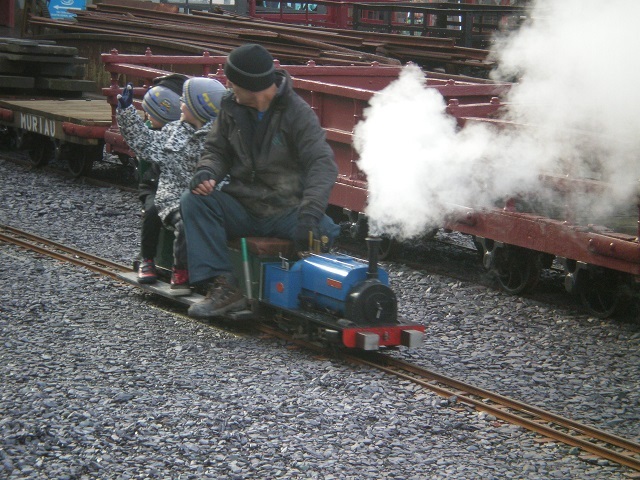 The engine was then enjoyed by the whole family throughout the day. 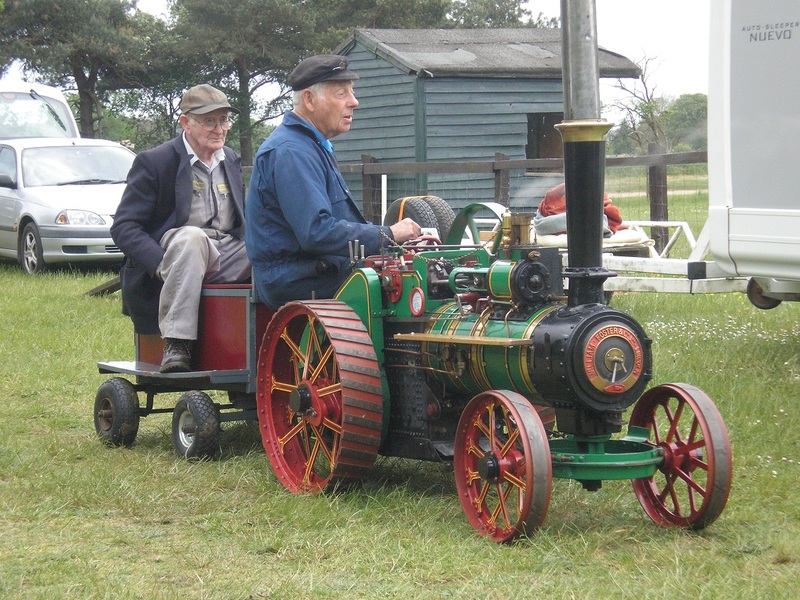 Norman and Colin had brought along the splendid 4” Foster agricultural, which was soon in steam and chuffing about. 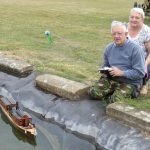 Chris was busy steaming his 3” Minnie “Scallywag”. 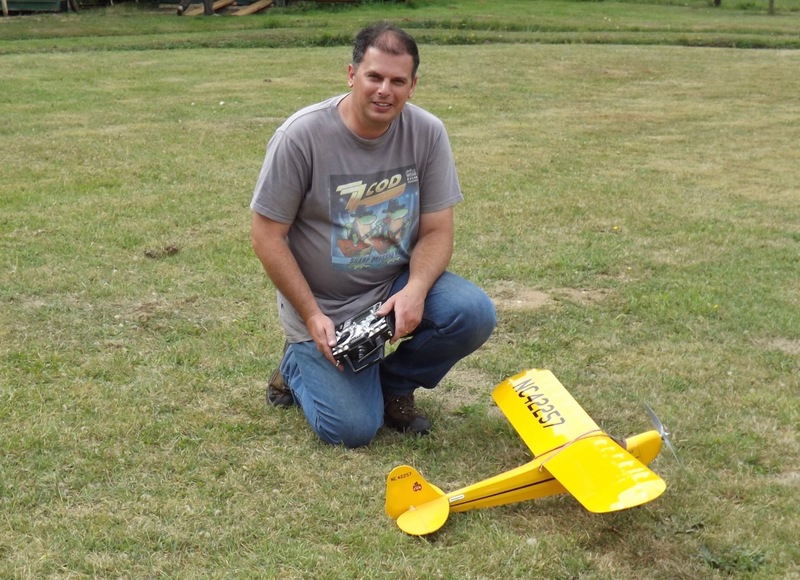 With its balanced crank and fine work it really does run well. Mike H’s nephew (I’m sorry, I never got his name!) 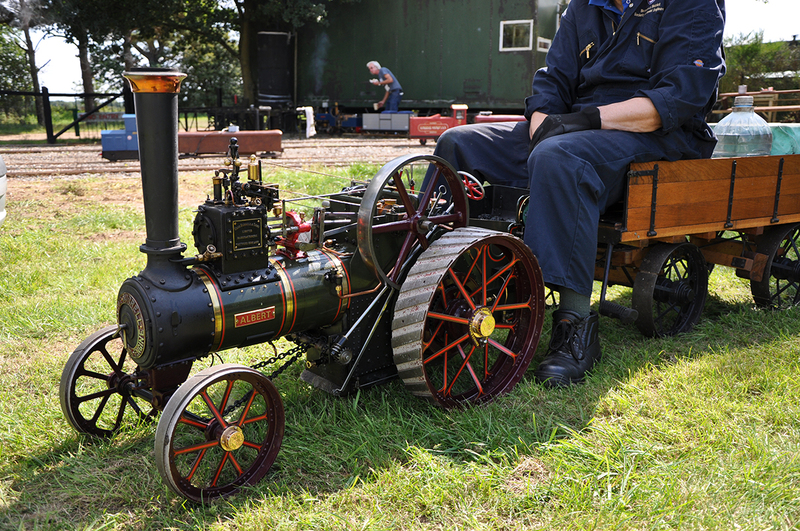 came along with his 3” Burrell agricultural and covered quite a distance on it throughout the day. 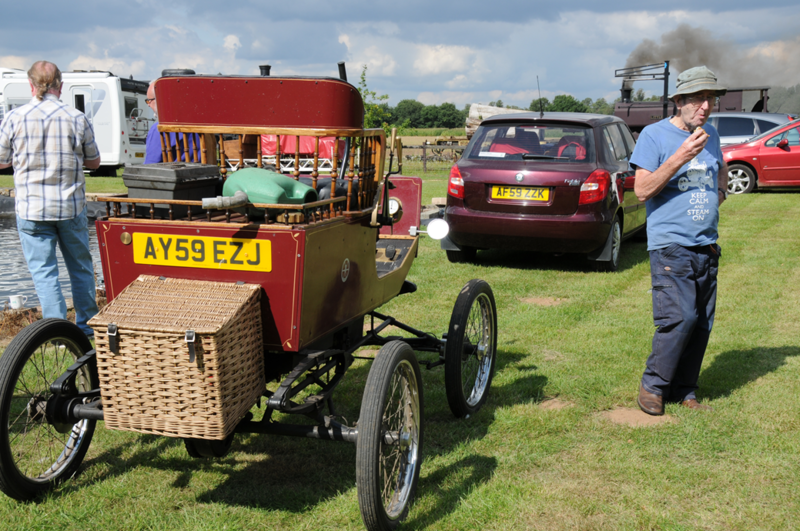 Ray also had his steam car running about; always nice to see. 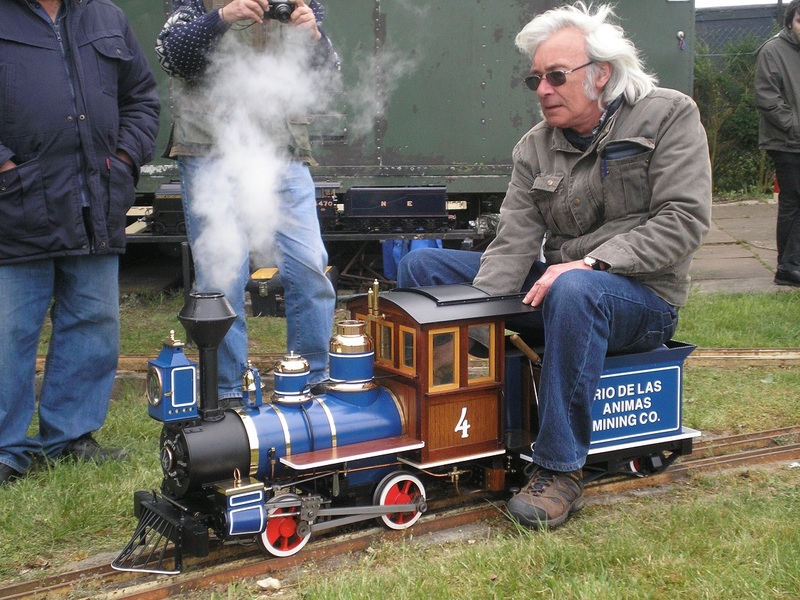 On the track we had a grand selection of locos; some steam and some electric. 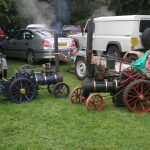 The steaming bays were gratifyingly full! 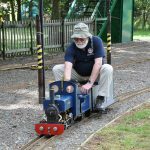 Pete from the Fenland Light Railway and the Peterborough club is one of our regular visitors and has been for many years. 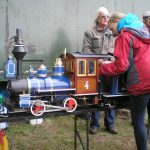 He had brought along his 5” battery electric Y6 tram engine, as well as a few friends. I hope you all had fun. 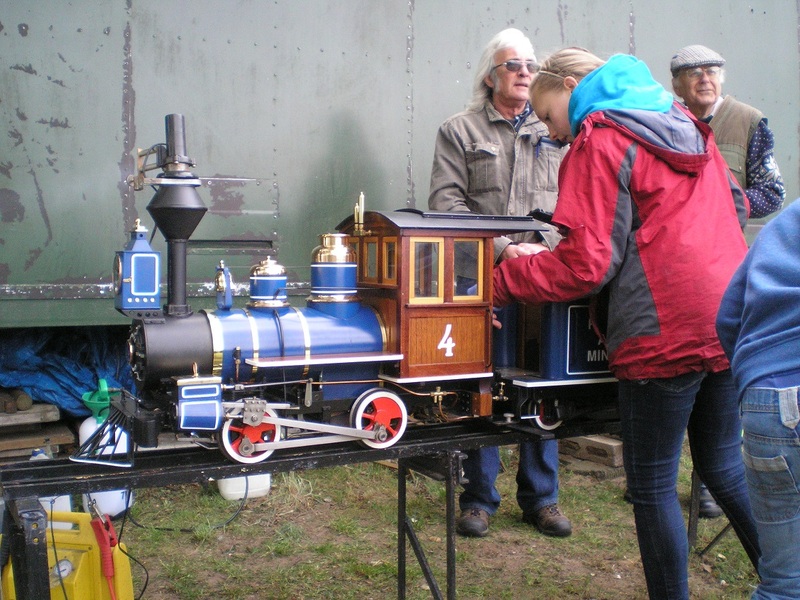 Mick W had his 3 ½” A1 “Great Northern” on static display. 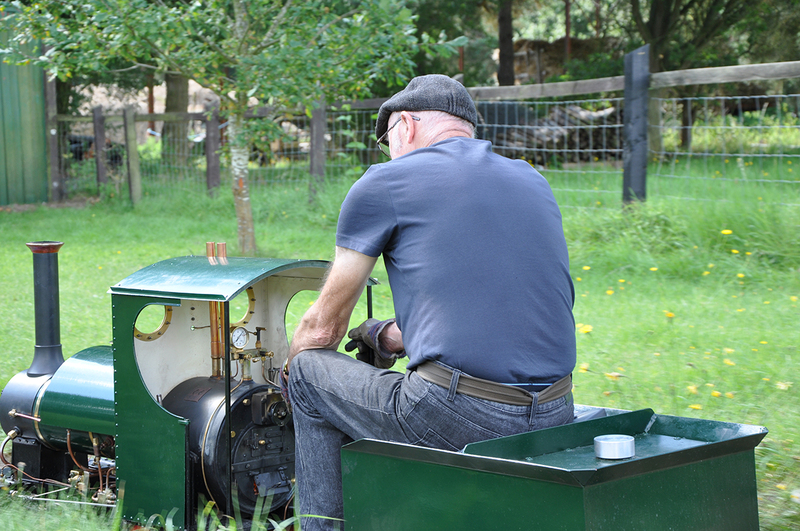 Mick acquired this engine part-built and has made a splendid job of finishing it off. 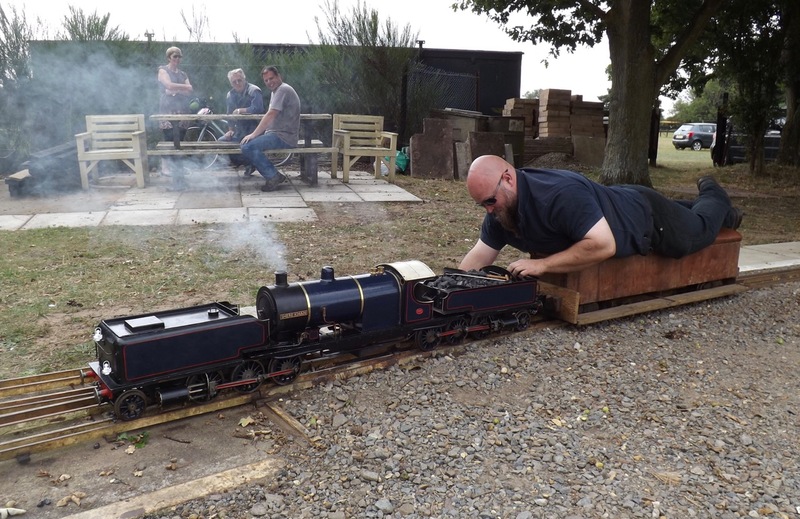 Myles had his 7 ¼” 2-6-0 tender loco “Baloo” also on static display, showing the progress he is making in re-commissioning this cracking engine. 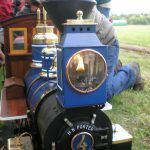 The new copper boiler is in the process of being fitted, together with the associated fittings etc. 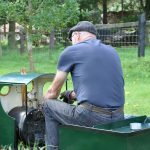 The ashpan is set to be the next hurdle to overcome, but with the help of club members I’m certain this little job will be tackled with confidence. We can’t wait to see it in steam. 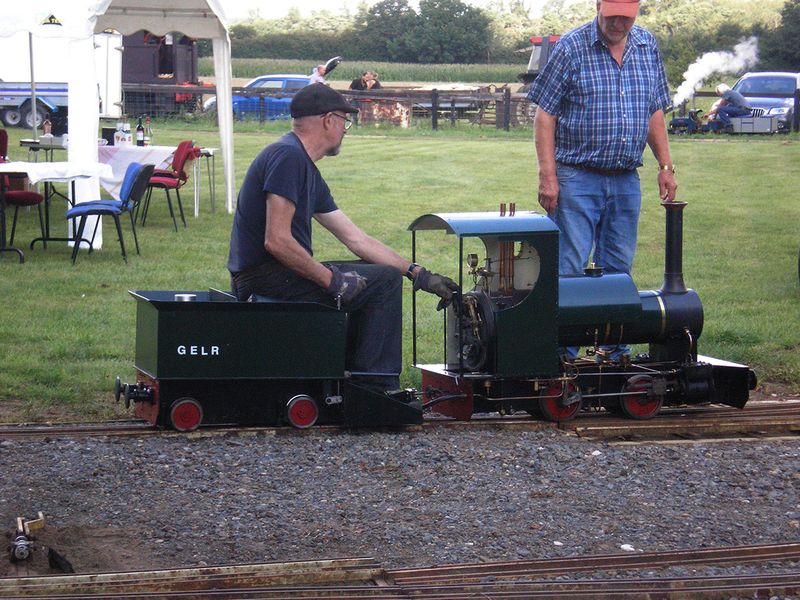 Mick W had also brought his 5” battery electric 08 shunter out for a play, together with newly acquired Klaxon hooter. We’ll certainly hear you coming now! 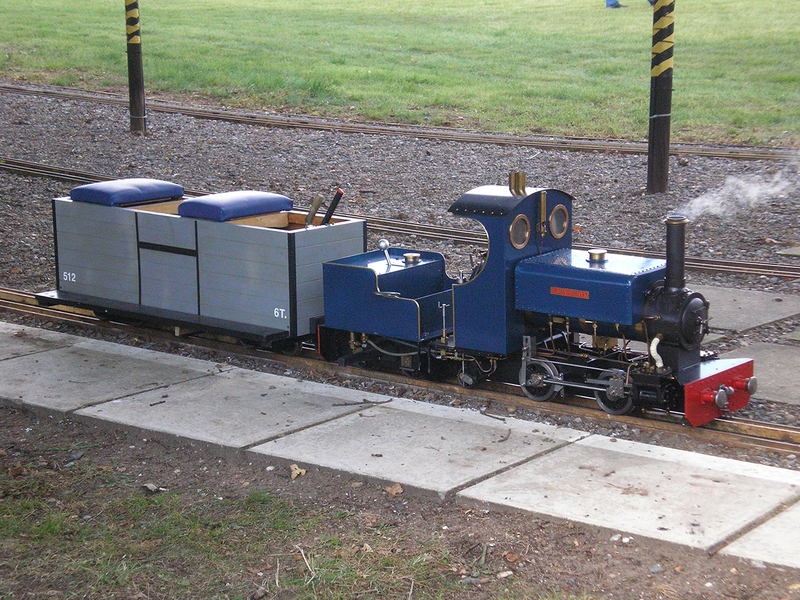 Fresh from the paintshop was Don’s new creation, an 0-4-0 7 ¼” battery electric shunter. Not quite finished, it was nice to see it on the track. 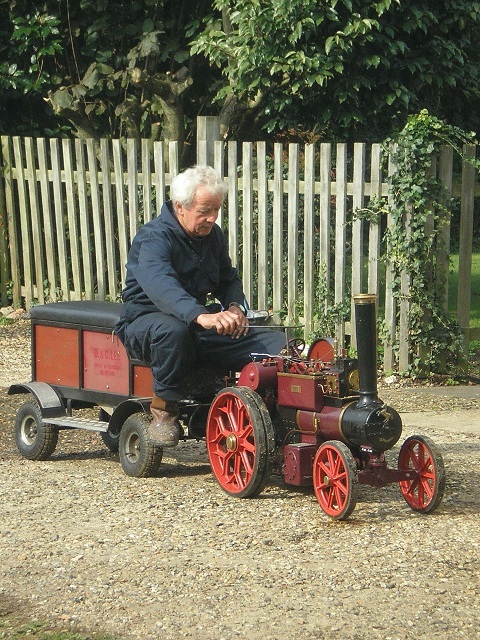 Hugh was seen running his 5” loco-boilered Sweet Pea. 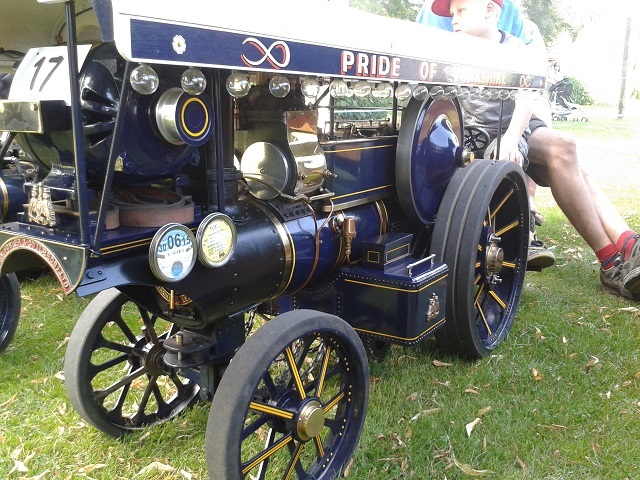 Very nicely made, this engine purrs around the track effortlessly. 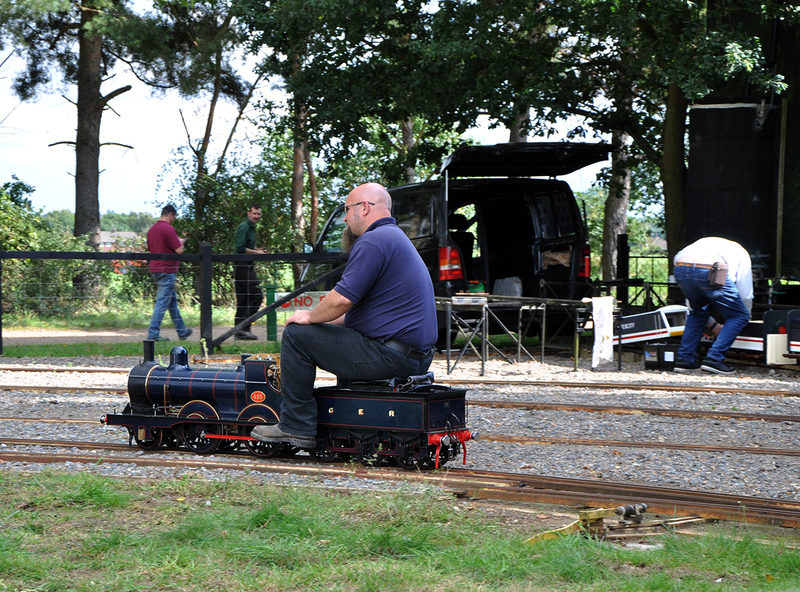 It was something of a momentous day for Geoff E as he was running his 7 ¼” Porter Marie Estelle for the first time on the track. 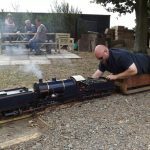 Geoff purchased the engine last year and has been working on it since. 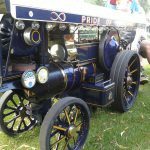 Firstly I must say that the engine looks superb with it’s new paintwork and shining brightwork; a real treat for the eye. Secondly, it runs very sweetly indeed, with evenly pronounced chuffs. 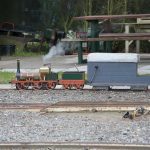 The attractive lamp on the smokebox is a fine addition (every engine needs it’s lamps!) 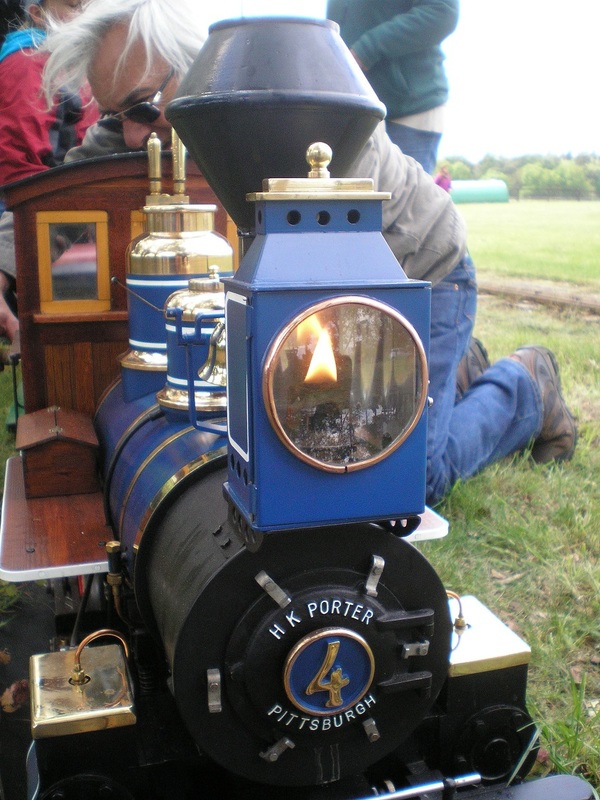 and is complete with a fully working paraffin burner inside. Very smart indeed! 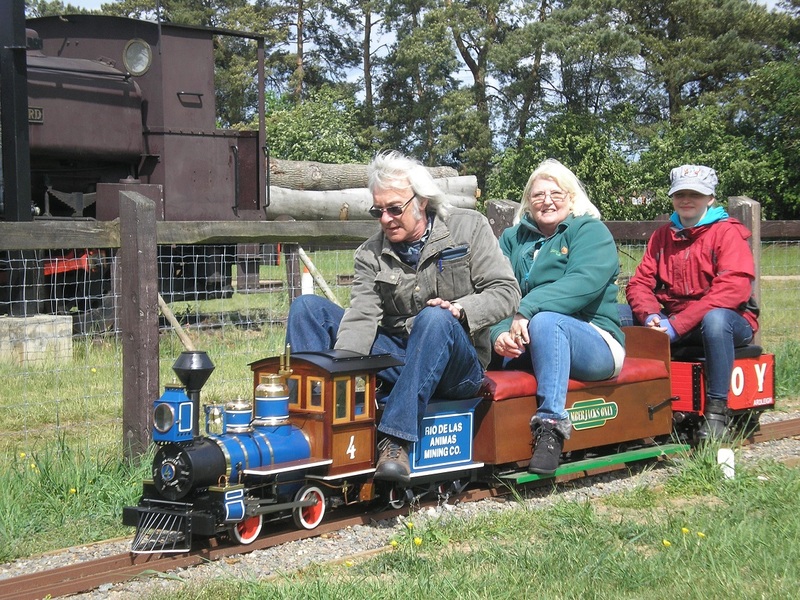 Geoff’s family came along as well, with Geoff’s granddaughter trying her hand at driving. 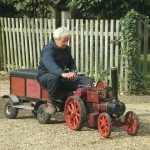 In fact I think she drove it more than Geoff! 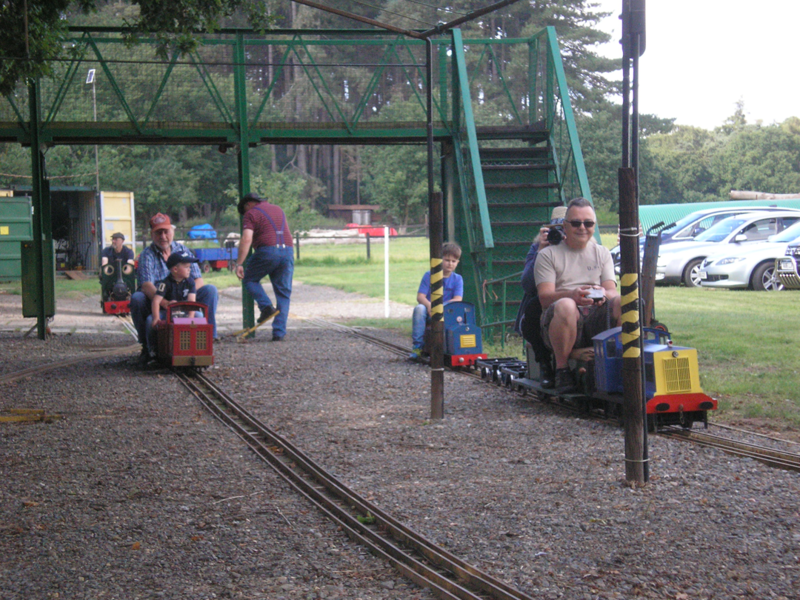 It looked great running around the track with the family on board. 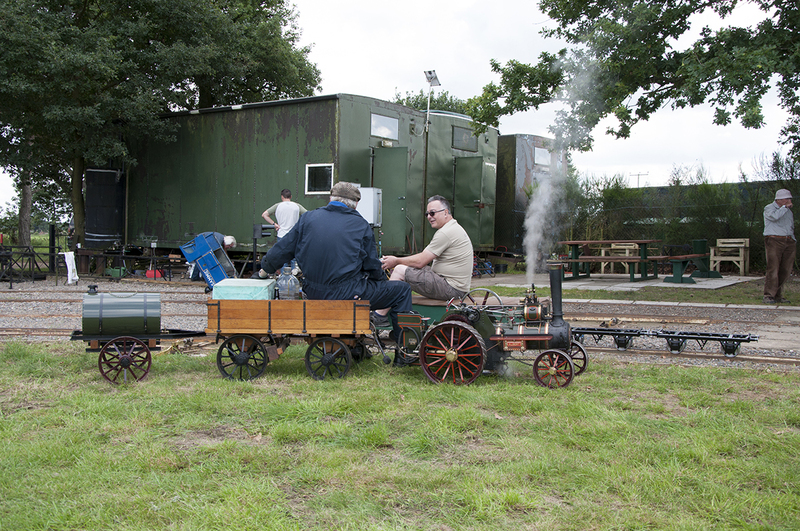 It’s fair to say that it was a successful steaming and enjoyed by all. 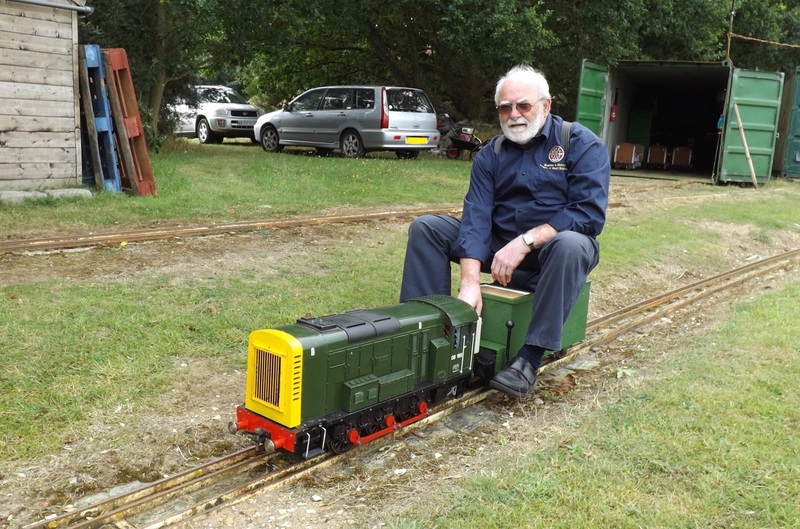 Unable to bring an engine along to play with, Kev brought the driving truck for his new project, a 7 ¼” gauge Y6 steam tram. 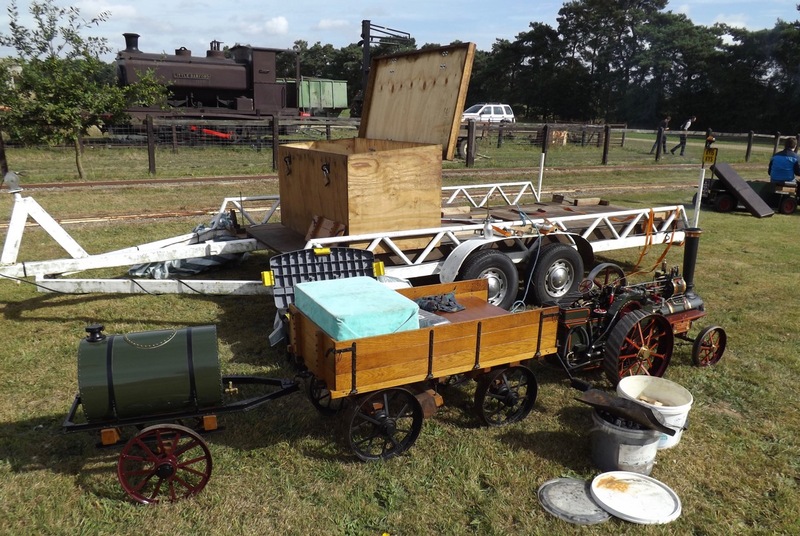 The wagon was put to use behind Geoff’s Porter and used to convey the family. 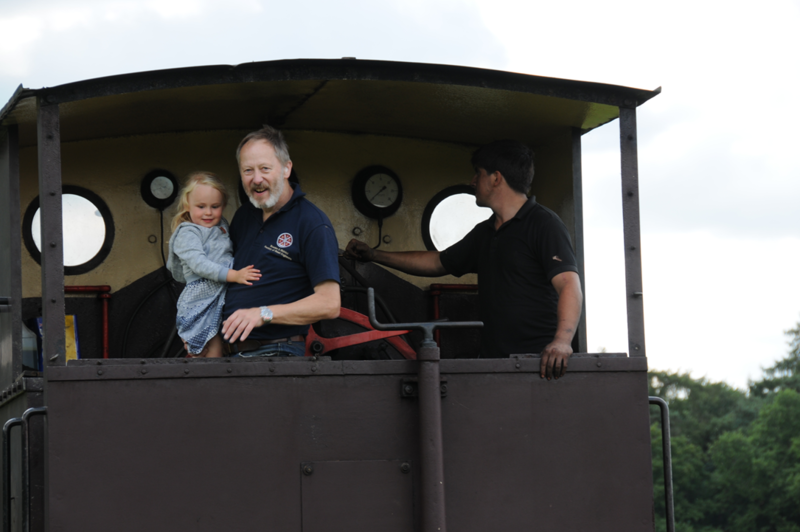 The club loco was giving rides to members and their families, with some of the youngsters having a drive, and very competent they were too. 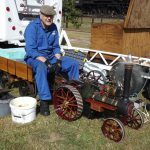 A very fine miniature internal combustion engine was also being run by Chris. 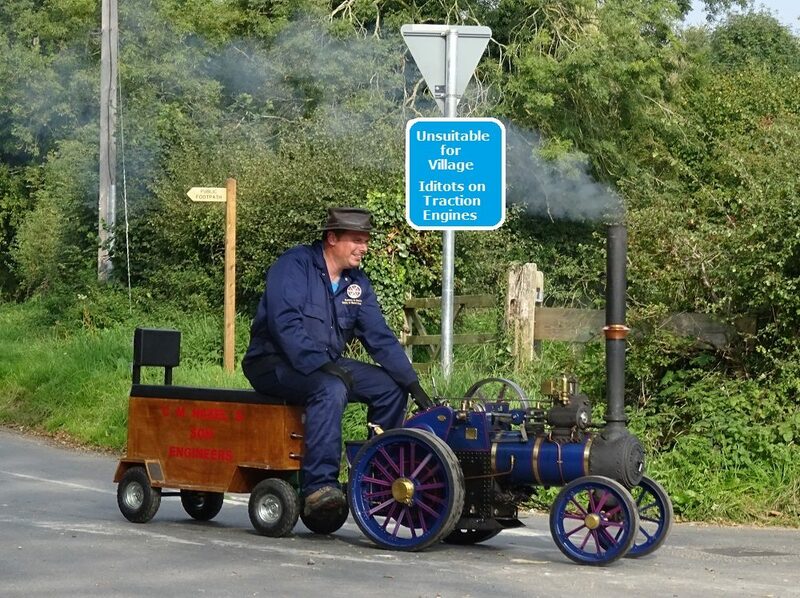 This is one of the many engines he has made over the years, and despite his protestations, it is certainly not the work of the “village idiot”! 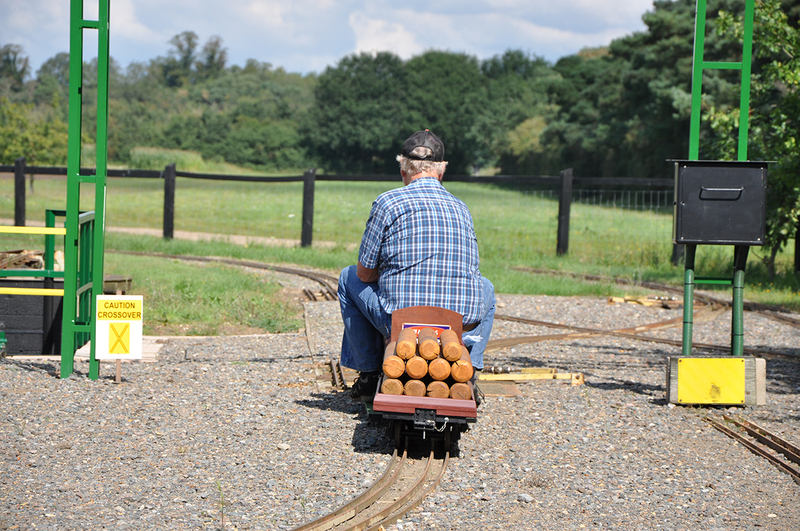 He even made the spark plug! 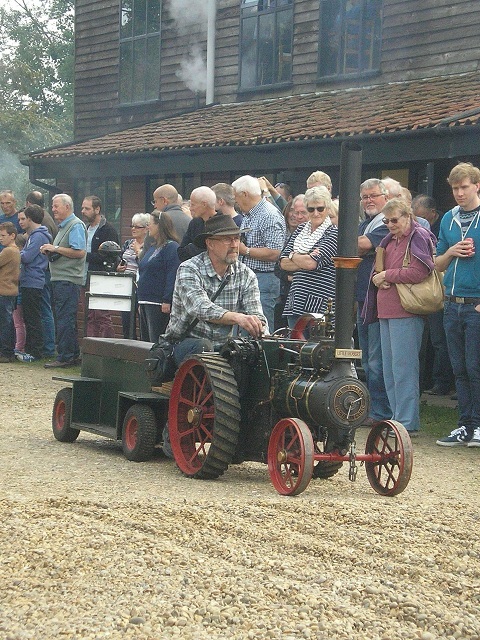 It ran really well and entertained quite a large crowd. 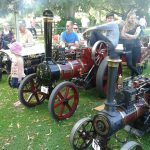 To control such a crowd perhaps the next running of this engine should be a ticket-only affair; be sure to get your tickets asap!! 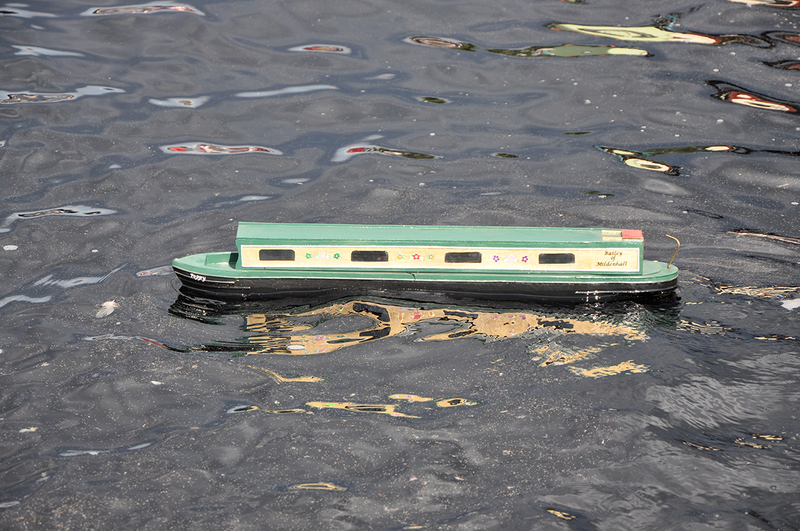 I apologise that I never managed to photograph the lovely model boats that were on the pond. Many people commented on how nice it was to see them. 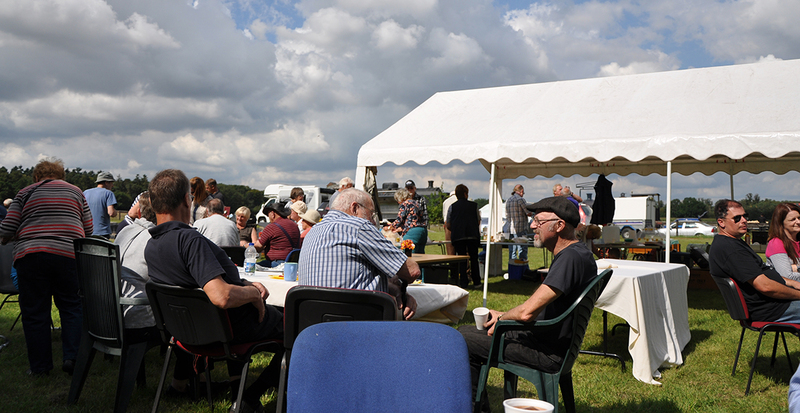 An excellent BBQ was provided, as well as teas, coffees and cakes, so I’m sure that no one went hungry or thirsty. 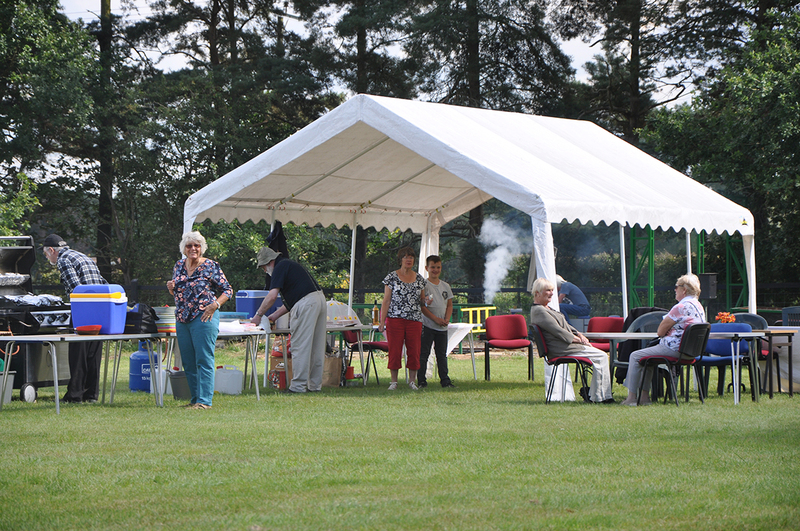 Many thanks to those who provided cakes and nibbles, and special thanks to those who cooked the BBQ and help to present the catering department so beautifully. 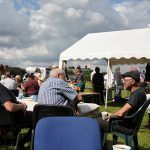 A raffle was drawn, and soon after, people started thinking about packing away and heading home after another really friendly and pleasant day. 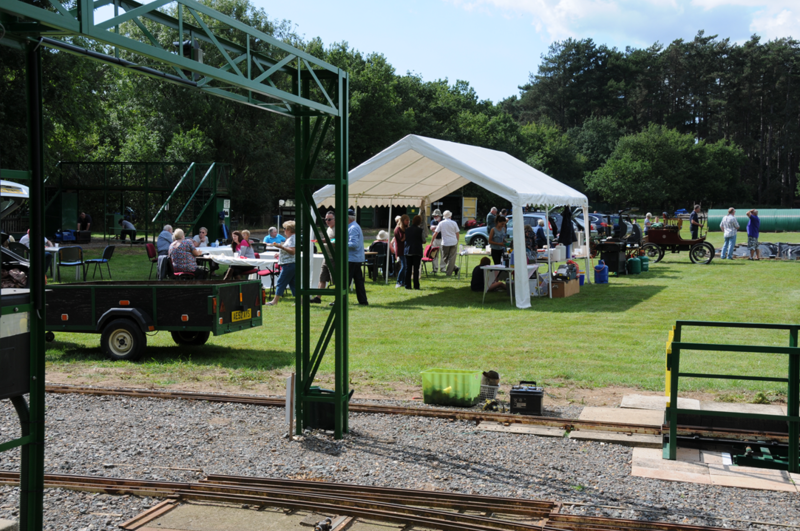 The small tent was erected within the railway field and used throughout the day as the base for the refreshments area, and to provide cover for any rain showers. 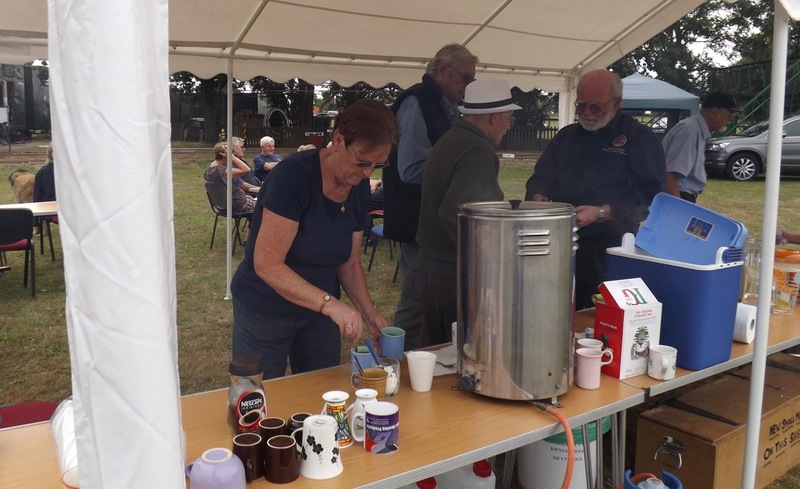 The refreshments were superbly laid-out, with a large selection of drinks available allowing people to help themselves during the day. 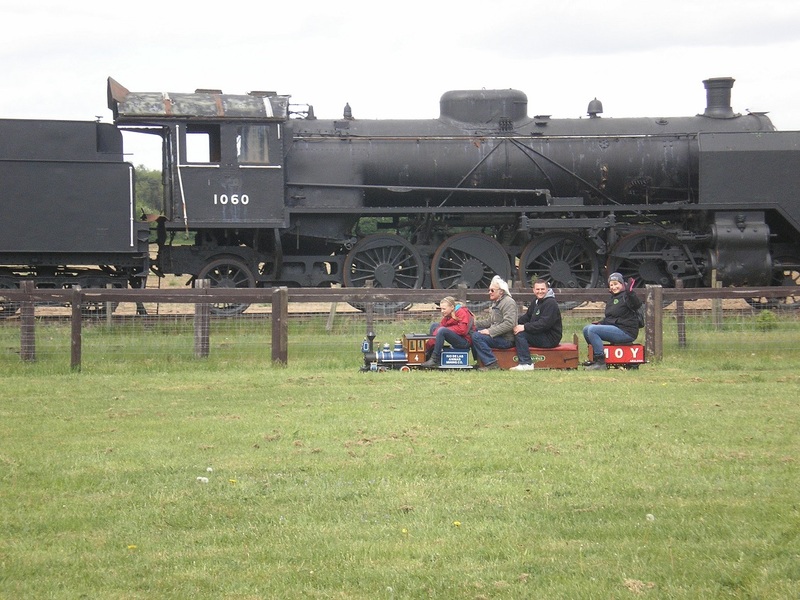 Our traditional lunchtime barbecue was ably driven by Stuart and a selection of willing helpers. 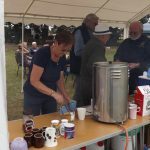 Once again this was a welcome addition to the day and we thank them for putting the time into making sure everyone was fed and watered. Our afternoon refreshment of cakes and biscuits was also well provisioned and our thanks go to those who provided these splendid goodies. 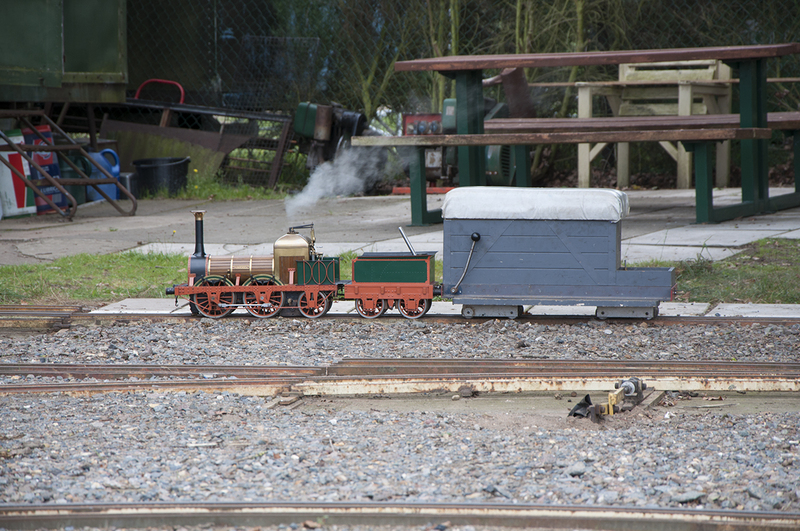 Andy and Finn were seen steaming Andy’s 4 ½” Burrell agricultural around the site. 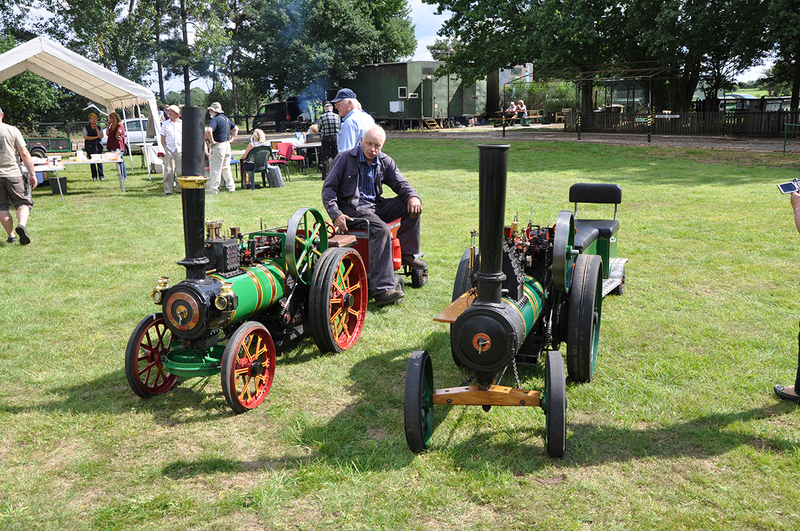 A recent task of Andy’s is to get the Pickering governors working. 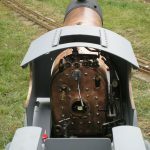 This is not an easy job as there are many elements to contend with; the gland needs to be just loose enough but must not leak, the springs on which the weights are fixed must be not too light or too strong, and the spring on the adjuster needs to be strong enough to bring the valve down when the speed drops. He has got it working, with only the tiniest amount of adjustment required to get it governing. 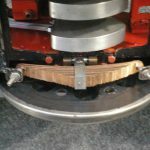 We look forward to perhaps seeing this perform on a sawbench or bailer. 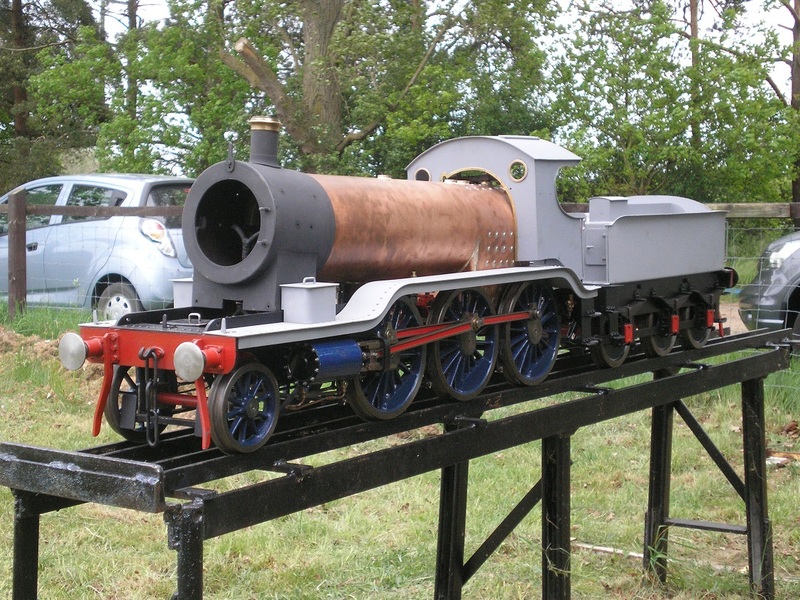 Norman’s 4” Foster agricultural was in steam and chugging about. Having been lucky enough to have a go, this really is a lovely engine to drive; docile, responsive, and powerful. 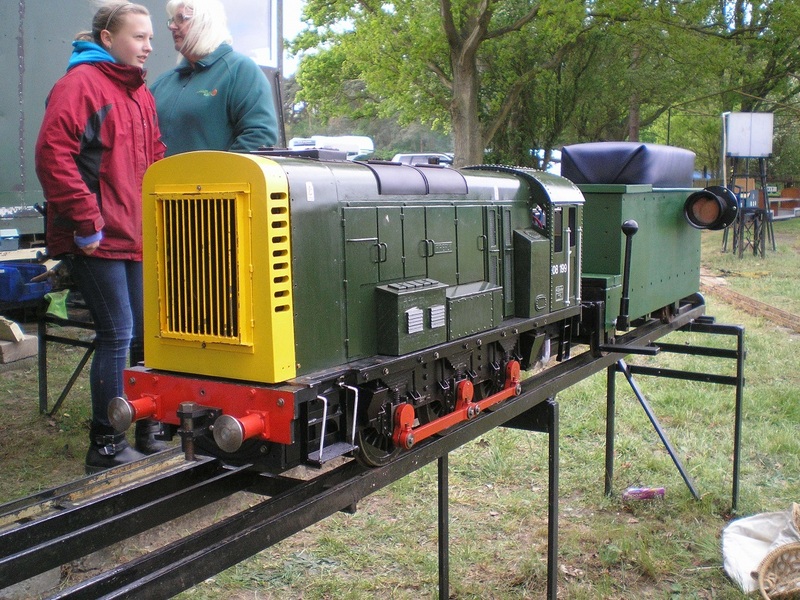 Geoff B had brought along his recently painted 3” scale Burrell agricultural. Finished in Burrell green with lake wheels, and together with the fine lining it looks fantastic. 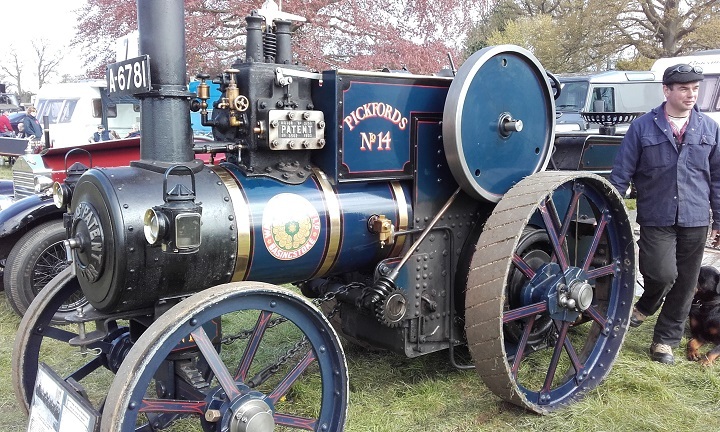 There is lots of clean brightwork on this engine including polished motion, levers and other parts, as well as polished eccentric straps. 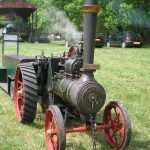 Consequently, with this “show finish”, I believe this engine would have been fit for displaying on Burrell’s sales stand at the local agricultural show! 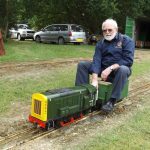 Geoff has also made a 3” scale traction wagon from which to drive his engine. 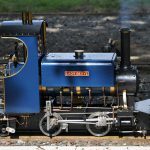 This is a very nice addition to a very nice engine. 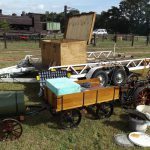 A well-made and detailed 3” water cart makes up this very attractive set. A beautiful collection. 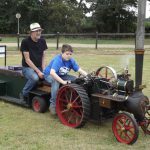 The engine runs well, too! 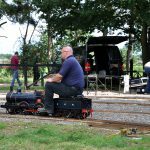 Mick had his 5” gauge 08 shunter on the track, with at least one of the youngsters having a go at driving it. 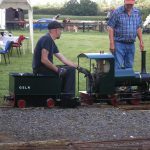 Having not been able to bring it to the May invite day, Kev had brought his 5” gauge Beyer-Garratt “Shere Khan” out for a play. 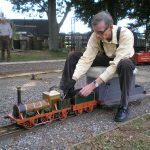 It is a bit time consuming to have to assemble the bits and pieces of this engine on the steaming bay, but it ensures that you can get an engine nearly 6’ long into a small car, albeit in bits! 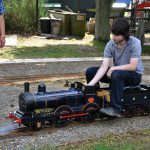 This time spent is well worth it, and the engine ran well throughout the day, with Myles having a spell at the regulator for a good deal of the afternoon. 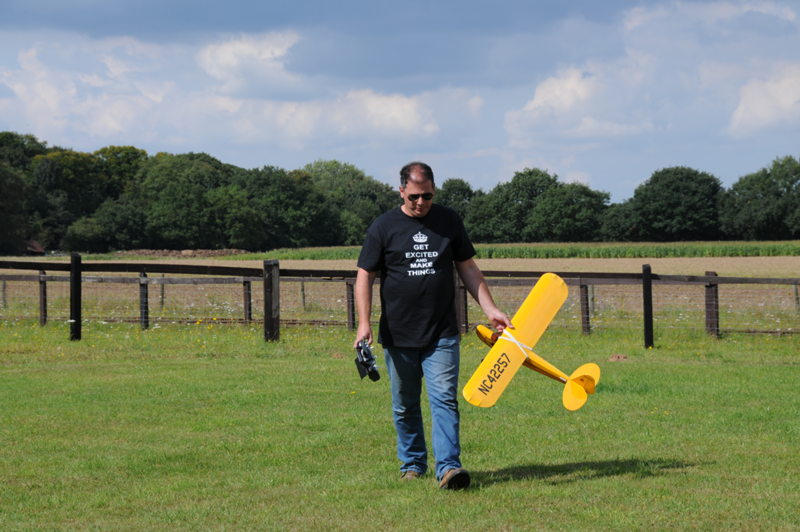 Chris H had left his traction engine at home, instead bringing one of his aeroplanes for a fly. 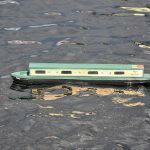 Other radio controlled items included a couple of fine model boats that were seen sailing on the pond. 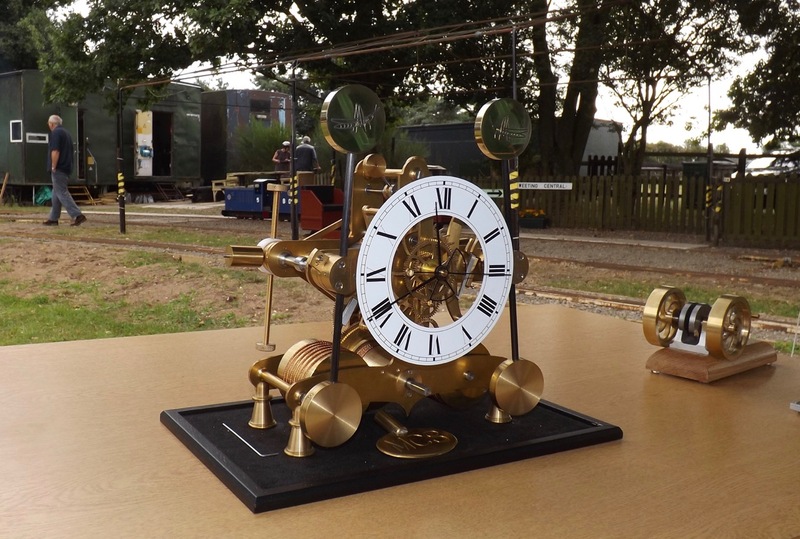 One of our newest members had brought a beautiful clock he had made. I sadly never got a chance to look at this but those who did see it said it was very impressive! 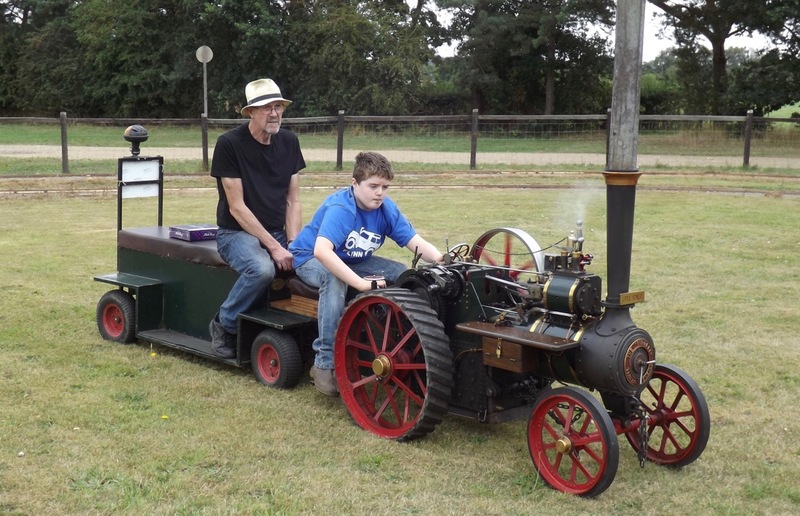 It is an understatement to say that Myles’ dad is something of an engineer, and he had on display a couple of compressed air engines he had built. 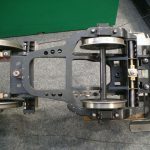 Methods such as wire eroding and CNC were used and the results are very smart indeed. 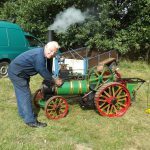 “Boiler” John had the large stationary steam engines in steam which always makes for a very impressive sight, and allows for the rare opportunity to get up close and personal with them. 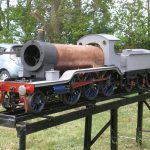 Resident standard gauge loco Andrew Barclay 0-4-0 “Little Barford” was in steam and chugging up and down its track. 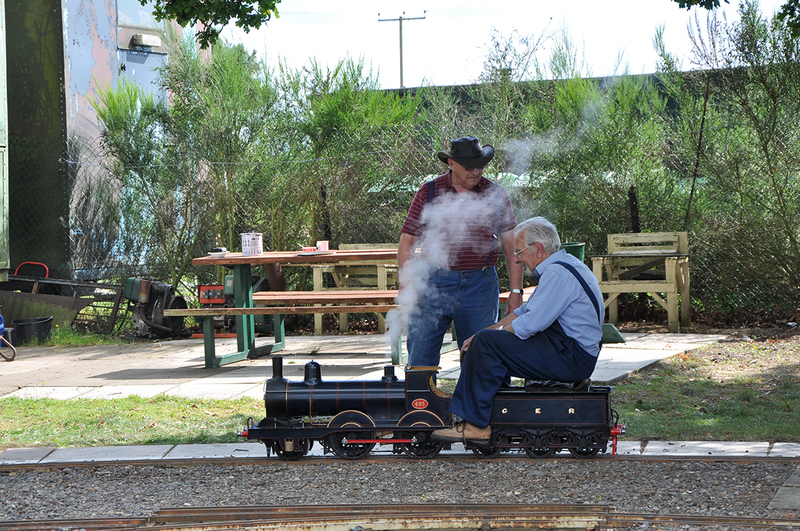 Thanks to those who were up early on a Saturday morning to get it in steam! The raffle was drawn mid-afternoon, and we are grateful for the many prizes donated. 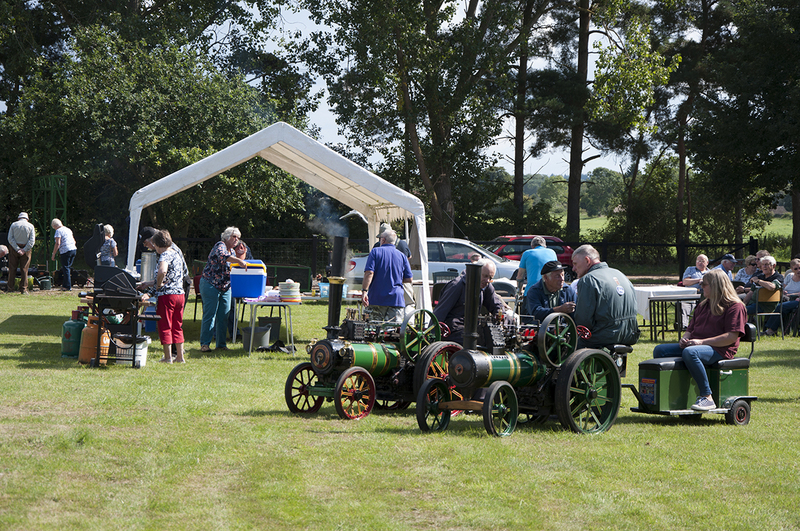 Once again we must thank the catering department for their great efforts in keeping appetites satisfied, and to all those who helped to make it a very enjoyable day.